Getting into this museum for the first time visit is "fun." Exit at the correct exit and then drive into an unseen road. I recommend you get instructions first. Our Garmin GPS did not get us there. This museum is mixed - indoor and comfortable and outdoors and in the Southern California sun. Be prepared for it. Hats, sunglasses, long sleeve cool shirts during the spring, summer, and fall. A lot of walking. The views and visibility of the airplanes is pretty good for the average visitor. If you are after specific detail ... Oh well. We did not ask the staff for special permissions. The day started somewhere else and was ending here and we were already cooked and tired on this summer excursion. The Soviets contracted or licensed many of their armament designs out and when they did those licensed items usually carried their own identification and NATO names. By the ID of "PZL" This is an Antonov AN-2 (NATO) Colt design built in Poland resulting in the "PZL." Empty weight approximately 7,300 pounds. Maximum weight approximately 12,000 pounds. Useful load approximately 4,700 pounds. Powerplant - One Shvetsov ASH-62 9 cylinder radial, supercharged engine, 1,000 horsepower. Maximum speed approximately 140 knots. Cruise speed approximately 110 knots. Range approximately 455 nautical miles. In production from approximately 1947 until 2002. We were flying missions off the USS Midway in the North Pacific east of Japan and south of the Aleutian Islands. We found an AN-2 Colt at about 250 feet above the water headed southwest at about 100 knots. He was over 500 miles away from near land. One of our airplanes tried to join up on him, difficult due to speed and altitude. The A-7E Corsair II had to maintain about 135 knots to ensure control. The pilot simply waved and smiled and continued. At his range and altitude we lost radar contact with him when we landed. We can only assume that 1) he had internal tanks, or 2) he got wet and cold. The Beech SNB-5 or simply "SNB" Expeditor is a derivative of the Beech 18 or Twin Beech series. It acquired the unofficial nickname of "Small Navy Bomber." In service with just about every branch and division of service for just about anything someone could think of this workhorse was everywhere it seemed. I have several flights in a Twin Beech, old C-45 version. The first flight was a daytime check-out flight then I made a round trip to Chicago O'Hare from Carbondale (MDH) hauling the mail in the dark of night with landings about every 60 miles on the 600 nautical mile round trip. I loved the airplane and thought it handled well. The maintenance was horrible and nothing seemed to work right. The plane loaded by post office workers was often out of CG or overloaded or both in my opinion even though the paperwork showed it was good. I landed and walked away from any future opportunities with the bird. Empty weight approximately 6,175 pounds. Maximum weight approximately 8,725 pounds. Useful load approximately 2,550 pounds. 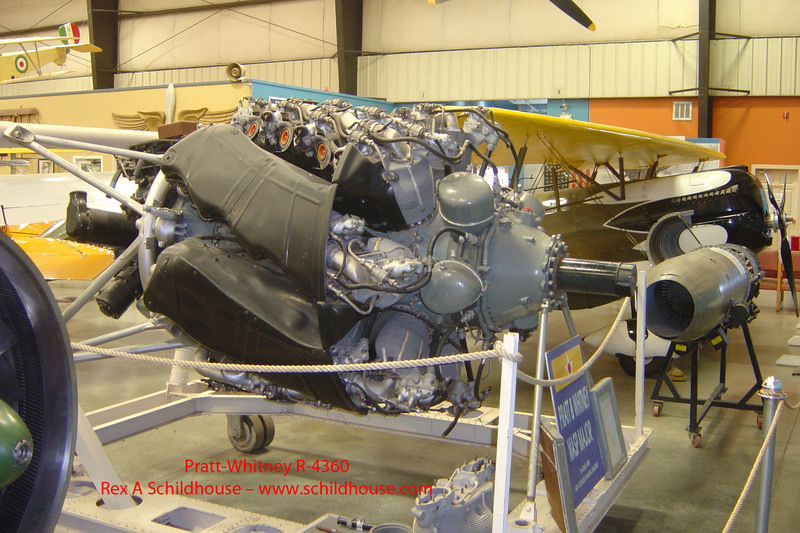 Powerplants - Two Pratt & Whitney R-985 Wasp Junior supercharged engines with 450 horsepower each. Maximum speed approximately 195 knots. Cruise speed approximately 145 knots. Range approximately 1,000 nautical miles. In production from approximately 1937 to 1970. An interesting airplane with an interesting heritage and history. It was the first fighter with a tricycle (nose gear) configuration for a U.S. manufacturer. Then Bell installed the engine mid-fuselage, behind the cockpit with a drive shaft running below the pilot's feet. A 37 MM cannon firing through the propeller hub was rather unusual as was the car door type entry into the cockpit. Initial armament included two .50 caliber machine guns in the nose. Armament changes included moving the .50 calibers to the wings and adding to .30 caliber machine guns. The P-39 saw service through WWII and was very popular with the Soviet Air Force. They were impressed by its high altitude performance against the Luftwaffe's bombers and thought it was a superb tank killer. The U.S. Army Air Corps / Air Force was not impressed with the high altitude performance. Empty weight approximately 5,345 pounds. Maximum weight approximately 8,400 pounds. Useful load approximately 3,625 pounds. Powerplant - One Allison V-1710 liquid cooled V-12 supercharged engine with 1,200 horsepower. Maximum speed approximately 325 knots. Range approximately 450 nautical miles. In production from approximately 1940 to 1944. With the experience of the P-39 Airacobra under its belt Bell Aircraft designed the B-59 Airacomet as one of the first jet powered U.S. fighters. The P-59 hardly got out of the prototype, testing, and learning phase of life with approximately 65 built of which 50 were "production" builds. Production models carried the 37 MM cannon of the Bell P-39 Airacobra as well as three .50 caliber machine guns. The limited number in use completed their flying services by 1950. Problems came from numerous factors including a jet engine that could effectively power the airplane with the appropriate response time to throttle movements. These types of engine problems were common to early jet engines but contributed significantly to killing the P-59 as other "modern to the day" propeller aircraft outperformed in almost after factor of the flight envelope. Empty weight approximately 8,165 pounds. Maximum weight approximately 13,700 pounds. Useful load approximately 5,535 pounds. Powerplants - Two General Electric J31 turbojets with approximately 2,000 pounds of thrust each. Maximum speed approximately 360 knots. Cruise speed approximately 325 knots. Production - approximately 65 were built in the early 1940s. Bell Helicopter UH-1 Iroquois or "Huey"
There are several helicopters that define the word "rotor wing" and the UH-1 Iroquois is one. It picked up the name "Huey" unofficially due to its original designation of HU-1, or "hui." Many pilots of the Huey do not even know or use the official name. Why? If you walked on a flight line and asked where the Iroquois was just about everyone would be confused. The UH-1 has gone through so many modifications and enhancements since its first flight in 1956 it would an encyclopedia all by itself. It added a new aspect to the Vietnam War when introduced by providing the ground forces a aerial highway to the combat zone. It also played THE major role in changing the "Hour of Care" for the wounded. A Huey medivac ride was faster and smoother than any vehicle traversing the jungles of Southeast Asia. From an unarmed transport helicopter the UH-1 became a gun ship and with that fostered the AH-1 Cobra series, which is basically a striped down, slimmed down UH-1 to reduce weight allowing more armament. The Bell UH-1 and its civilian counterpart flies on every continent and over over ocean of the world. As a military aircraft there is hardly a "free world" military, remember the Iron Curtain fell, that does not have a Bell UH-1 or a licensed model. Main rotor diameter approximately 48 feet. Length approximately 57 feet with main rotor forward. Empty weight approximately 5,215 pounds, however varies significantly with the variant. Maximum weight approximately 9,500 pounds, however varies significantly with the variant. Useful load approximately 4,285 pounds, however varies significantly with the variant. Powerplant - One Lycoming T53 turboshaft engine with 1,100 shaft horsepower. Other variants are equipped with other engine configurations including twin-engine installations. Maximum speed approximately 115 knots. Range approximately 275 nautical miles. In production from approximately 1959 to 2000 depending on the military or civilian variant. Bell Helicopter AH-1 Cobra or "Snake"
The Bell AH-1 Cobra, a derivative of the UH-1 Iroquois / "Huey," and is probably one of four or five helicopters that "define" rotor wing aviation at first glance. Like the UH-1 there are so many variants of it out there that its history would most likely be a set of encyclopedias. And, like the UH-1 with an official name of Iroquois, the AH-1 has an unofficial name of "the Snake." And, like the UH-1, you will find that the AH-1 in some variant has served in many of the "free world" militaries with known operations on every continent except the Antarctic and even that is a possibility. Conceived by a joint effort of the U.S. Army and Bell Helicopter due to combat damage incurred by the UH-1 in the Vietnam War theater of operations. This effort also resulted in the specialization of the pilots. With the complexity and flexibility of the weapons systems installed in the AH-1 flight and operations were just far enough away from those of the UH-1 that to fly them both as a general aircraft was to sacrifice the capabilities of each aircraft in their own right. While this is a two man aircraft with the weapons systems operator sitting in the front, the Cobra has several rescues where the individual was strapped onto a wing stub or sat on a skid. In one medivac challenge the weapons systems operator remained behind and the casualty was placed in the front seat for the flight. There is a program to put surplus AH-1s into service with the U.S. Forestry Service as wildland fire fighting assets. Main rotor diameter approximately 44 feet. Length approximately 53 feet with main rotor forward. Empty weight approximately 5,810 pounds, however varies significantly with the variant. Useful load approximately 3,690 pounds, however varies significantly with the variant. Powerplant - One Lycoming T53 turboshaft engine with 1,100 shaft horsepower on early models to two turboshaft engines when the twin engine enhancement was made. Maximum speed approximately 190 knots. Range approximately 310 nautical miles. In production from approximately 1967 to the present depending on the military variant. The Boeing B-17 Flying Fortress is one of the numerous icons from the WWII era. Due to needs of the Army Air Corps / Army Air Force the B-17 production was also licensed out to other manufacturers. While classified as a heavy, high altitude, long range bomber the B-17 was an "open air," unpressurized, bomber which required the crew to be dressed for the cold and on oxygen as the aircraft climbed. It was truly a flying fortress with guns in the nose, tail, top, bottom, and on both sides. Few avenues of attack on the B-17 were out of firing range and when flown in proper formation no area of the formation was considered undefended. Because of this and the desire for the most accurate bombing possible B-17 flights, often accompanied by other aircraft with similar protection capabilities, were flown over Europe in massive daylight raids while the Luftwaffe was still a significant force to be contended with. Losses were substantial in men and machines. The B-17 carried 13 .50 caliber machine guns in 8 positions and could carry up to 17,600 pounds of bombs depending on the range and other armament requirements. Most raids were accomplished with less than 4,500 pounds of bombs due to weight constraints. Wing span approximately 104 feet. Empty weight approximately 36,135 pounds. Maximum weight approximately 65,500 pounds. Useful 29,365 load approximately pounds. Powerplant - four Wright R-1820 Cyclone 18 cylinder supercharged, 1,200 horsepower engines. Maximum speed approximately 250 knots. Cruise speed approximately 160 knots. Range approximately 1,740 nautical miles. In production from approximately 1936 to 1945. The Boeing C-97 Stratofreighter series met every challenge and role the U.S. Air force asked of it. It was a freighter as well as modified into an aerial tanker and served for more than 25 years being introduced in the jet age and continued to hold its place in the jet age as faster and fancier aircraft came and went. The C-97 series is actually a derivative of the B-29 series and fostered the Boeing 377 Stratocruiser commercial airliner and the Guppy and Pregnant Guppy special mission aircraft. All aircraft in the series, the B-29, C-97, and Boeing 377 were fully pressurized and heated for comfort and safety. In civilian service the Boeing 377 did not fair will with a limited production due to engine problems with the Pratt & Whitney R-4360 and the cost of purchase and operations relative to other aircraft. In military service the aircraft, while a mission accomplishing workhorse required "adjustments" by any receiving aircraft when operated in the tanker role. It was not fast enough or the high flyer required to satisfy the jets. Therefore the receiving jet had to descend and slow down significantly to refuel from the KC-97 variants. HOWEVER, it seemed, when needed, they were always there. That justified their continued service in the jet age. Wing span approximately 141 feet. Empty weight approximately 82,500 pounds. Maximum weight approximately 175,000 pounds. Useful load approximately 92,500 pounds. Powerplants - four Pratt & Whitney R-4360 28 cylinder supercharged radial engines with 3,500 horsepower each, often "augmented" by two General Electric J47 turbojet engines. Maximum speed approximately 350 knots. Cruise speed approximately 200 knots. Range approximately 2,000 nautical miles. In production from approximately 1951 to 1956. The Boeing B-29 Superfortress is one of the most iconic bombers of WWII with its notes in history of dropping both the atomic bombs on Japan. Another note in history is that its total project cost exceeded the total project cost of the Manhattan Project which produced those atomic bombs. How could such costs be justified? The B-29 required technology to be developed, tested, refined, and installed in one airframe as it had never before been done. The B-29 is pressurized and heated throughout its crew compartments. To allow the crew to move within the aircraft there is a "tunnel and shuttle" system installed between the front and rear areas passing through the unpressurized bomb bay. The guns were radar controlled and the developmental costs of those systems were part of the total project costs. The B-29 was powered by four Pratt & Whitney R-4360 28 cylinder supercharged radial engines. Throughout their life the R-4360 were a maintenance problem and installation problems compounded their service on the B-29. While designed for high altitude bombing of Japan due to the variations of winds as the bombs fell from 30,000 feet or higher accuracy suffered to a point that the B-29 had to sacrifice that capability and lower itself into the fighter and antiaircraft envelope of the Japanese military. This exposed the 11 man crew to dangers the aircraft was designed to protect them from. The 11 .50 caliber guns were somewhat successful in protecting the lower flying Superfortresses. One or more B-29s landing in Russia / Siberia after bombing raids on steel plants in Manchuria supporting the Japanese war efforts. 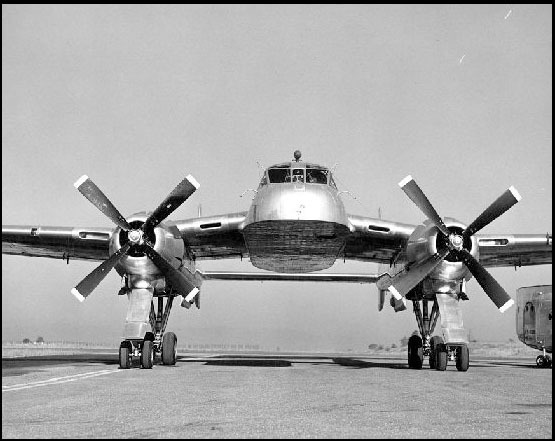 The Soviets copied the B-29 as their Tupolev Tu-4 Bull bomber and their Tupolev Tu-40 transport. The B-29 Superfortress is the basis for the C-97 Stratofreighter, the Boeing 377 Stratocruiser commercial airliner, and the B-50 Superfortress series. Empty weight approximately 74,500 pounds. Maximum weight approximately 133,500 pounds. Useful load approximately 59,000 pounds. Powerplants - Four Wright R-3350 18 cylinder Duplex Cyclone supercharged radial engines with 2,200 horsepower each. Some B-29s were modified to four Pratt & Whitney R-4360 28 cylinder supercharged radial engines with 3,500 horsepower each, this is the configuration of the Boeing B-50 Superfortress. Maximum speed approximately 310 knots. Cruise speed approximately 190 knots. Range approximately 2,800 nautical miles depending on armament loading. In production from approximately 1943 to 1946. If you are a Jimmy Stewart fan, you know the Boeing B-47 Stratojet from the 1955 movie Strategic Air Command. Boeing used captured German aerodynamics research data in the development of the B-47. Boeing engineers added their own innovations to the design such as the tandem landing gear mounted on the center line of the fuselage and outriggers in the inboard engine pods for stability. The Stratojet's six engines mounted in two inboard pods of two and two outboard pods of one would start a design feature of many following Boeing products as well as many of its competitors. Designed as a nuclear bomber the B-47 never saw combat action in any role while other aircraft designed to the nuclear bomber role were modified to conventional bombing configurations or other roles. Among the ancillary roles for the B-47 airframe were a photo reconnaissance role, an electronic reconnaissance / warfare role, and a weather reconnaissance role. The design was pushing the envelope and it did have problems throughout its life. Some of these could be easily aggravated by a pilot lacking the skill and attention to detail required by the Stratojet. These issues included a sluggish take-off and a fast landing. The B-47 had a reputation of wanting to porpoise, bounce nose to tail, on landing which required a go-around to correct or a trip to the hangar for some serious repair work. My Mother's cousin logged several hundreds of hours in the B-47 and said he loved the airplane as it flew like the largest fighter ever designed. He claimed an unofficial record in the Stratojet for the quickest around the world flights ever flown. On one flight he did tight 360 turns around both the magnetic and geographic north poles. Wing span approximately 116 feet. Empty weight approximately 79,100 pounds. Maximum weight approximately 230,000 pounds. Useful load approximately 150,900 pounds. Powerplants - Six General Electric J47 turbojet engines with 7,200 pounds of thrust each. Maximum speed approximately 530 knots. Cruise speed approximately 485 knots. Range approximately 1,750 nautical miles depending on armament loading. In production from approximately 1947 to 1957(?). Joyce is showing the older series of the turbojet engines of the inboard pod of the B-47. A good look at the center line landing gear of the B-47. This is a cockpit training for the B-47. Interesting configuration which shows how it could carry the feeling of a fighter in a bomber. However, the yoke seems out of place. The Boeing B-52 Stratofortress sets records every day it flies. It has been flying since 1955 and has now been flown by three generations of the same family, grandfather, father, and son or daughter as the rules changed. Few, if any other, airplanes can make that statement. The B-52 has gone through numerous modifications over the years and has numerous airframes adapted for special uses and aerodynamic testing. One of these was the mother ship for the X-15 aircraft. Initially designed as a nuclear bomber as the world changed so did the B-52 with a modification called "The Big Belly Mod" with the B-52D allowing it to carry heavy bomb loads of conventional ordinance starting in the Vietnam War. Besides letter designated changes such as B, C, and D each model often had numerous variants within the model series. One of the more critical was the integration of an ECM (Electronics Counter Measure) suite to assist in the protection of the bomber force as it entered hostile territory. Even with this level of technological protection a number of B-52s were lost due to enemy fire during the Vietnam War or due to airframe failure. The "BUFF" (Big, Ugly, Fat, Fellow) continues in service today 59 years after the first model went into service. As the structure of the U.S. Air Force changed and the capabilities of the B-52 changed the aircraft operations were transferred from one operational organization such as SAC (Strategic Air Command) to others such as the Air Force Global Strike Command (AFGSC). Regardless of the operator, the BUFF sits ready to respond to the call when the alert klaxon goes off. The B-52 has seen conventional warfare usage in Vietnam, Desert Storm, Operation Allied Force bombing Serb targets in Yugoslavia, Operation Enduring Freedom in Afghanistan, and Operation Iraqi Freedom in Iraq. With the successes of operations and the durability of the airframe the U.S. Air Force announced in 2012 that the BUFF's tour of duty was being extended to 2040. My Mother's cousin flew the B-52 out of Thailand and Guam during Vietnam and loved the airplane as a vehicle that met the needs of the boots on the ground and protected the (usually) 5 man crew to the best of its ability. Marvin's wing lost several B-52s over Vietnam. Wing span approximately 185 feet. Empty weight approximately 185,000 pounds. Maximum weight approximately 488,000 pounds. Useful load approximately 303,000 pounds. Powerplants - Eight Pratt & Whitney TF33 turbojet engines with 17,000 foot pounds of thrust each. Maximum speed approximately 560 knots. Cruise speed approximately 440 knots. Range approximately 3,900 nautical miles depending on armament loading and mission requirements, can be airborne refueled. In production from approximately 1952 to 1962. The bomb bay of the B-52 is huge. The racks have been removed from the display bird. Notice the universal mountings in the upper corners. The Cessna O-2 Super Skymaster, occasionally called the Super Bird Dog as the follow-on to the O-1 Bird Dog is a modification of the company's Cessna 337 Skymaster. The military version has increased visibility with panels in the overhead area and in the door panels and had hard points on the wings for rockets and mini-guns. The Super Skymaster was acquired to provide better service as forward air controller and spotters for ground and air units as the Vietnam War progressed. With the larger payload weight the aircraft carried more communications gear than the O-1 Bird Dog and with its multi-engine configuration was more reliable. Other modifications of the fixed gear Cessna 336 and retractable gear 337 were accomplished by Cessna and other companies. These modifications included additional hard points for mountings on the wings and turbo-prop engines. These modifications never got past USAF evaluations. However, sales in these configurations were made to other governments. Wing span approximately 38 feet. Empty weight approximately 2,780 pounds. Maximum weight approximately 4,630 pounds. Useful load approximately 1,850 pounds. Powerplants - 2 Continental IO-360 reciprocating engines with 210 horsepower each. Maximum speed approximately 170 knots. Cruise speed approximately 135 knots. Range approximately 1,325 nautical miles. In production from approximately 1967 to 1975. Through my Military career I saw a lot of Tweety Birds all over the U.S. The Air Force Training Command seemed to have the same attitude as the Naval Aviation Training Command - Weekend? Give them a plane, an instrument flight syllabus, and a credit card. Talking to the instructors and students flying the Tweety Bird both seemed to enjoy it and liked the side-by-side seating in the cockpit. Another asset was the aircraft was "self-supporting" in that when it landed for fuel it did not require any external power sources to start. The pilots liked that the Tweety Bird was fully aerobatic but commented that flying skills were required to compensate for the limited power within the g limits of the airframe. The T-37 airframe was modified to the A-37 Dragonfly. This modification included the same engines as the North American T-2C Buckeye, the General Electric J-85 series. This gave the Dragonfly substantially more power than the T-37 and enabled it to carry fuel tanks and ordinance under almost every inch of its wings. With the added capacity for inflight refueling the Dragonfly had the capacity to stay airborne for hours on end. Numerous governments operated and continue to operate the T-37/A-37 series. A simple, small, economical, dependable airframe for training, close air support, and forward air control requirements. There are also several operating within the U.S. under civilian registration. Wing span approximately 34 feet. Empty weight approximately 4,055 pounds. Maximum weight approximately 6,570 pounds. Useful load approximately 2,515 pounds. Powerplants - 2 Continental-Teledyne J69 turbojet engines with 1,025 pounds of thrust each. Maximum speed approximately 370 knots. Cruise speed approximately 225 knots. Range approximately 810 nautical miles. In production from approximately 1955 to 1975. The Convair C-131 Samaritan is the same basic airframe as the Convair CV-240 and the U.S. Military's T-29 Flying Classroom. The CV-240 was designed to replace the unpressurized and aging Douglas DC-3 civilian and military C-47 / R4D. Adopted by the U.S. military as the C-131 / T-29, the aircraft served many roles such as transport, training, and as a research and development platform. It as not uncommon to find the C-131 configured as executive transport sitting side-by-side with a C-131 configured for troop transport or cargo. The T-29 series had numerous modifications which included the installation of tactical aircraft radar systems and numerous internal consoles which the student could operate with the instructor positioned next to him. Wing span approximately 105 feet. Empty weight approximately 29,250 pounds. Maximum weight approximately 47,000 pounds. Useful load approximately 17,750 pounds. Powerplants - 2 Pratt & Whitney R-2800 Double Wasp 18 Cylinder reciprocating supercharged engines producing 2,500 horsepower each. Maximum speed approximately 255 knots. Cruise speed approximately 220 knots. Range approximately 390 nautical miles. In production from approximately 1954 to 1956. The Convair F-102 Delta Dagger is one of the numerous "Century Series" (100 and on) fighters which were supersonic. The Delta Dagger was also the first delta wing interceptor aircraft for the USAF. The most distinctive issue of the F-102 was the incorporation of a "waist wasp" design where the cross section of the fuselage is reduced from approximately the 50% of the length to approximately 80% of the length of the fuselage. While it seems counter-intuitive to "put contours into the fuselage" it significantly reduced the drag in improved performance. The F-102 Delta Dagger, identified in profile by the point at the tip of the vertical fin and forward intakes if visible, flew from the mid 1950s into the 1970s for the USAF and U.S. National Guard units. A number of the airframes were converted to full sized target drones. The F-102 Delta Dagger was the development basis for the Convair F-106 Delta Dart. Empty weight approximately 19,350 pounds. Maximum weight approximately 31,500 pounds. Useful load approximately 12,150 pounds. Powerplant - One Pratt & Whitney J57 turbojet afterburner equipped engine with 17,200 foot pounds of thrust. Maximum speed approximately 715 knots. Cruise speed approximately 375 knots. Range approximately 1,170 nautical miles. In production from approximately 1953 to 1960(?). This is one very narrow airplane. When you look at the F-106 Delta Dart its vertical fin will be flat and its intakes will be farther back and above the wings. One of Ed Heinemann's designs for Douglas Aircraft the Douglas EA-1A Skyraider is a significant modification to the basic A-1 or AD-1, depending on the timeframe reference. This modification turned a dive bomber / torpedo bomber / ground support airplane into an airborne early warning (AEW) platform. While the attack role A-1 had a single seat for the pilot, some aircraft modified for night attack or for AEW missions had three seats. During my career flying the Grumman E-2 Hawkeye AEW aircraft for the U.S. Navy several of our pilots had come out of the EA-1A aircraft. All the pilots were totally dedicated to the Electronic Skyraider as stable, versatile, comfortable but warm to hot depending on the climate. As a ground support aircraft the A-1 Skyraider had to be at the front of the pack. Not the fastest but one of the longest on station times with substantial ordnance options and weight. Carrying four 20 MM cannons the A-1 Skyraider could also carry in excess of 8,000 pounds of bombs on external hard points. With combat experience in Korea and Vietnam there are many ground forces of U.S. allies that appreciated what the Skyraider pilots could provide them in the way of support. Wing span approximately 50 feet. Empty weight approximately 11,970 pounds. Maximum weight approximately 25,000 pounds. Useful load approximately 13,030 pounds. 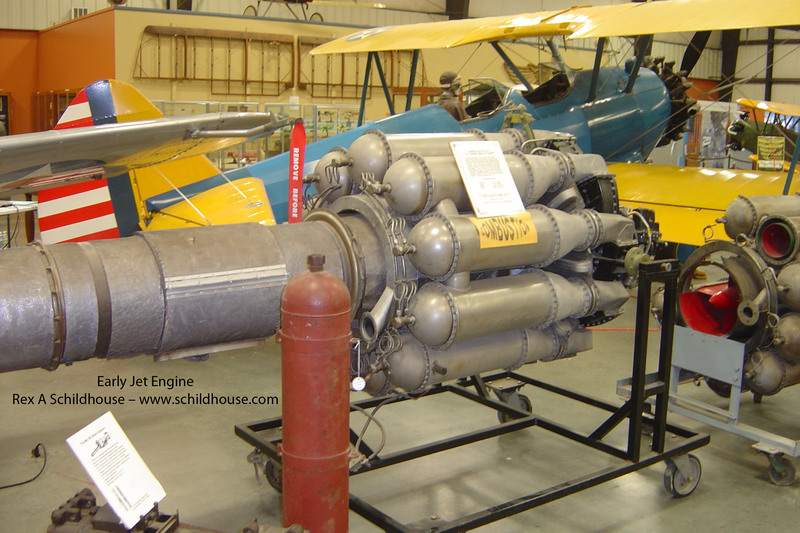 Powerplant - One Wright R-3350 Duplex Wasp supercharged 18 cylinder radial engine. Maximum speed approximately 280 knots. Cruise speed approximately 175 knots. Range approximately 1,145 nautical miles. In production from approximately 1945 to 1957. The Douglas A-26C Invader was designed as a day / night attack bomber with a crew of three. A single pilot cockpit, a navigator / loader, and a gunner. The upper and lower guns were aimed by a periscope system. Depending on the version, the A-26 Invader was equipped with as many as 8 .50 caliber machine guns. The Invader also had a bomb load of as much as 8,000 pounds between internal fuselage stations and wing mount hard point mounts. The Douglas A-26 series fit nicely into the needs of the WWII battle plan and continued its service through the Korean War and into Vietnam. Its "after military" life includes fire bomber roles throughout North American due to its payload, handling, and reliability. Wing span approximately 70 feet. Empty weight approximately 22,850 pounds. Maximum weight approximately 35,000 pounds. 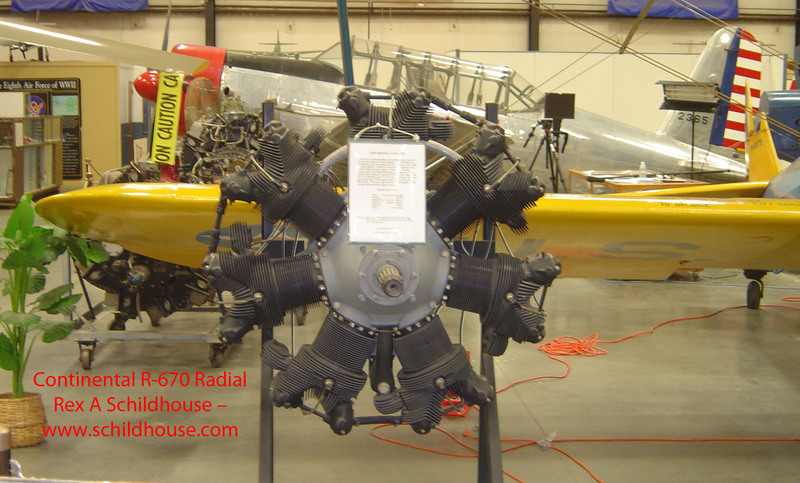 Powerplants - Two Pratt & Whitney R-2800 Twin Wasp 18 cylinder supercharged radial engines. Range approximately 1,200 nautical miles. In production from approximately 1942 to unknown. The Douglas DC-3 / C-47 / R4D / C-117 / C-53 came by two common names depending on the operator Skytrain common to the U.S. and Dakota common to Canadian and British operators. Numerous modifications were made to the civilian DC-3 unpressurized airliner to convert it to the numerous models of the C-47 / R4D versions. The most significant ones included the installation of a cargo door with paratrooper door contained within it and the replacement of the plush interior seating with military transport web seating lining the fuselage walls. Some of these paratrooper configurations were C-53 Skytroopers. U.S. Paratroopers such as my Dad, a member of the 101st Airborne Division, The Screaming Eagles, called it "One Way" as they only rode it one way, field to the jump zone. The C-47 series flew in every theater of combat during WWII, in the Korean War, in the Vietnam War, and into the early 1980s as station aircraft for the U.S. Navy. Built as civilian or from the military production units the DC-3 series still flies worldwide today in close to original configuration or with modifications to turboprops very reliably on wheels, skis and floats. My college operated a DC-3 purchased new by General Motors in a earlier life for executive transport and a C-47 converted to civilian licensing for a regional carrier who later donated it to the school. We also had two "maintenance" birds used for training and education. Starting the R-1830s was an adventure. As the pilot, you started #2 first since you could only hear it and watch the gauges. Then came #1 and you, as the pilot, got to watch the beautiful radial belch smoke and oil all over the ramp. I got taxi qualified in our birds and my paperwork stated "Must operate the aircraft with cowl flaps full open at all times." The logic or belief was that the airplane could not takeoff if the cowl flaps were full open. One of the folklore stories of the DC-3 series, which is true, is that on a demonstration flight for single engine performance the right, critical engine, was feathered during the takeoff roll in Albuquerque, New Mexico. The DC-3 flew single-engine over the mountains into Los Angeles, California closing the deal. It was performance and reliability such as this that make it a success wherever the plane went. Wing span approximately 96 feet. Empty weight approximately 18,135 pounds. Maximum weight approximately 31,000 pounds. Useful load approximately 12,865 pounds. Powerplants - 2 Pratt & Whitney R-1830 Twin Wasp 14 cylinder supercharged radial engines producing 1,200 horsepower each. Cruise speed approximately 140 knots. Range approximately 1,390 nautical miles. In production from approximately 1936 to 1950. The Douglas C-54 Skymaster is not considered a WWII plane when seen but it was a workhorse during the war as a long-haul carrier and executive transport due to range and comfort it its pressurized cabin. Interestingly in the development of the DC-4 series the original "experimental" DC-4 prototype was substantially down scaled in complexity to create the DC-4 / C-54 series we know today. The DC-4 / C-54 was flown by the U.S. Navy as the R5D. The C-54s in military service were often reserved for long-haul rather than intra-theater operations. President Franklin D. Roosevelt rode in C-54s for his meetings with Prime Minister Churchill and Stalin. The Skymaster is the iconic aircraft of the Berlin Airlift of 1948. While military service of the C-54 / R5D spanned 1942 through 1975 civilian service of the DC-4 continues around the world as a dependable passenger and freight hauler. Wing span approximately 118 feet. Empty weight approximately 38,930 pounds. Maximum weight approximately 73,000 pounds. Useful load approximately 34,070 pounds. Powerplants - 4 Pratt & Whitney R-2000 Twin Wasp 14 cylinder supercharged radial engines producing 1,450 horsepower each. Maximum speed approximately 240 knots. Cruise speed approximately 165 knots. Range approximately 3,475 nautical miles. In production from approximately 1942 to 1947. The Fairchild C-119 Flying Boxcar is the follow-on to the Fairchild C-82 Packet project of initiated in the last years of WWII. Designed as with multi-roles in mind, the C-119 was a troop transport, a paratrooper transport, and a cargo hauler for several services including the U.S. Navy, the U.S. Marine Corps, and the USAF. The C-119 Flying Boxcar saw service in the Korean War and in Vietnam. Service in Vietnam included a gunship configuration. They continue their service, all equipped with the optional turbojet engine, as fire bombers with numerous contractors in the western U.S.
Wing span approximately 109 feet. Empty weight approximately 39,980 pounds. Maximum weight approximately 74,000 pounds. Useful load approximately 34,020 pounds. Powerplants - 2 Wright R-3350 Duplex Cyclone 18 cylinder radial supercharged reciprocating engines, often equipped with 2 General Electric J-85 turbojet engine producing 2,850 foot pounds of thrust mounted under the wings or 1 Westinghouse J-34 turbojet engine producing 3,400 foot pounds of thrust mounted above the fuselage. Range approximately 1,980 nautical miles. In production from approximately 1949 to 1955. This plane is not in the March Field Air Museum but is of interest. 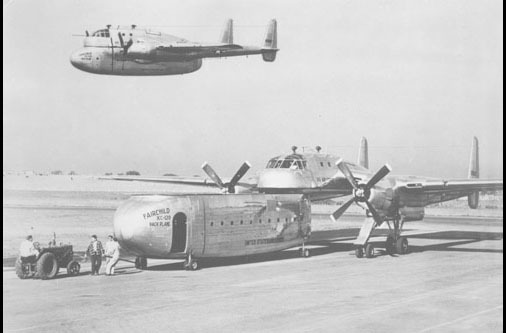 Based on the C-119 Flying Boxcar Fairchild developed the C-120 Packplane as a prototype. After evaluation it went nowhere. The photos are from Wikipedia and other Internet sites. Some are from or through the San Diego Air and Space Museum without copyright information located. With the removal of the lower portion of the C-119 Flying Boxcar fuselage the configuration of the landing gear became interesting. Both the "forward" and "rearward" gear were mounted in the engine pylons. According to the photos and write-ups there were numerous pod configurations including a medical evacuation unit. Not sure I would like to be transported out in a detachable pod at 20,000 feet. With the pod shown in the photos, the clam shell doors opened at both ends of the pod so you could drive through or unload / load from both ends. The Fairchild C-123 Provider went into service in 1956 and served with the USAF until 1980. It continues to serve numerous foreign governments and private operators. Actually designed by Michael Stroukoff, founder of Chase Aircraft. Due to manufacturing limitations production was arranged with Kaiser-Frazer. This production was stopped due to a congressional investigation of Kaiser-Frazer in relation to contracting to Fairchild on the C-119 Flying Boxcar. The USAF, needing the C-123 Provider, contracted it out directly to Fairchild and the rest is history. To add to this curvaceous path to production, the development of the C-123 started out as a glider with Chase Aircraft, upgraded to powered flight as the YC-122 and then finalized as the XC-123 after additional modifications. In various configurations the C-123 Provider was pure cargo, up to 60 passengers, or 50 stretchers with space for appropriate attendants. During the Vietnam War the C-123 Provider was one of the several aircraft utilized in the Agent Orange spray operations. The C-123 Provider is one of the airplanes in the movie Air America starring Mel Gibson and Robert Downey Jr. Mel Gibson uses the crashed C-123 Provider as a "Parking lot" concealing them from aerial surveillance. Wing span approximately 110 feet. Empty weight approximately 29,900 pounds. Maximum weight approximately 60,000 pounds. Useful load approximately 30,100 pounds. Powerplants - 2 Pratt & Whitney R-2800 Double Wasp 18 cylinder radial supercharged reciprocating engines, often equipped with 2 General Electric J-85 turbojet engines producing 2,850 foot pounds of thrust. Maximum speed approximately 215 knots. Cruise speed approximately 180 knots. Range approximately 1,280 nautical miles. In production from approximately 1949 to 1970. Designed for the RAF the Folland FO-141 Gnat became the trainer follow-on to the de Havilland Vampire T. Mk 11. While used as a trainer by the RAF, the Gnat was also used by the RAF's Red Arrows aerobatic team. In the service to other governments the Gnat served in training and photo reconnaissance roles. The Folland FO-141 Gnat ended its service to the RAF in the late 1970s. Its life in other theaters continued on. Wing span approximately 22 feet. Empty weight approximately 5,140 pounds. Maximum weight approximately 8,630 pounds. Useful load approximately 3,490 pounds. Powerplant - 1 Bristol Siddeley Orpheus 100 turbojet engine with 4,520 foot pounds of thrust. Maximum speed approximately 550 knots. Range approximately 500 nautical miles. In production from approximately 1955 to unknown. The General Dynamics F-111 series was one of the several joint service aircraft projects that failed. While adopted by the USAF and the Royal Australian Air Force the size and weight precluded service with the U.S. Navy as a carrier based aircraft. The F-111 series a swept wing fighter/bomber aircraft. The installation of wing mounted hard points for ordnance make the aircraft a very complex operations and maintenance system. The Aardvark has side-by-side seating in the cockpit and ejection is an capsule system for both the pilot and navigator/bomber. After significant losses in early deployment to Vietnam War the F-111 with modifications introduced in 1972 continued to service very successfully through the end of the Vietnam War. Combat experience for the Aardvark continued into Operation Desert Storm with the current technology weapons. The F-111 series was basically retired by the USAF in the late 1990s and by the RAAF in the late 2010 timeframe. There is an electronics warfare version, the EF-111A Raven. The Raven has a General Dynamics airframe with major modifications done by Grumman Aerospace. Grumman is a leader in tactical electronics warfare with the EA-6A (Electric) Intruder and EA-6B Prowlers as well as the Grumman E-2 series aircraft. Wing span approximately 63 feet spread, 32 feet swept. Empty weight approximately 47,200 pounds. Maximum weight approximately 100,000 pounds. Useful load approximately 52,800 pounds. Powerplants - 2 Pratt & Whitney TF-30 turbojet engines with afterburners, 25,100 foot pounds of thrust. Maximum speed approximately 1,435 knots. Cruise speed approximately 595 knots. Range approximately 4,200 nautical miles with aerial refueling. In production from approximately 1964 to 1976(?). The Grumman HU-16 Albatross is one of Grumman's numerous amphibious aircraft. Before being redesignated as the HU-16, the Albatross was also the SA-16 for the USAF and JR2F-1 and UF-1 for the U.S. Navy and Coast Guard. While the Albatross was capable of landings in sea states of greater than four feet, it had difficulty in taking off from heavy sea states unless something like JATO (jet assisted take off) was available. JATO is usually several simple rockets. The HU-16 saw extensive search and rescue service in both the Korean War and Vietnam War before being retired by the USAF. When retired by the Navy the aircraft was often a station asset for assigned pilots. The Coast Guard flew the Albatross until it was replaced by the HU-25 Guardian by Dassault and the Lockheed HC-130 Hercules. The Albatross is still in governmental and private service in many parts of the world. Several have been modified with turboprop engines for greater dependability and performance. Several Coast Guard HU-16s were stationed at NAS Corpus Christi, Texas. NAS Corpus was a joint use field with the Navy, Coast Guard, and Army. I was stationed there with the Navy flying the T-28B, T-28C, TS-2A, and US-2B. You would get a stiff neck just walking around one of these birds. It is TALL! Wing span approximately 97 feet. Empty weight approximately 22,880 pounds. Maximum weight approximately 35,700 pounds. Useful load approximately 12,820 pounds. Powerplants - 2 Wright R-1820 Cyclone 9 cylinder supercharged radial engines with 1,200 horsepower each. Maximum speed approximately 205 knots. Cruise speed approximately 130 knots. Range approximately 2,850 nautical miles with long range tanks. In production from approximately 1949 to 1961. The Lockheed Lodestar has several model numbers and other designations depending on the operator - Lockheed 18, U.S. Navy - R50, U.S. Army Air Corps - C-56, C-57, C-59, C-60, and C-66 among others. While the R50-5 is powered by the Wright R-1820 Cyclone other power plants included the Pratt & Whitney R-1690 Hornet, the Pratt & Whitney R-1830 Twin Wasp engines. With the U.S. entering WWII many Lockheed Lodestars were "impressed" into service as military transports. Many of these were overhauled and returned to civilian service after the conflict was over. Several notable modifications include Bill Lear's Learstar and Howard Aero's Howard 250. While originally conventional gear - tail dragger, some were modified to tricycle - nosewheel, configurations. Wing span approximately 66 feet. Empty weight approximately 12,500 pounds. Maximum weight approximately 21,000 pounds. Useful load approximately 8,500 pounds. Maximum speed approximately 230 knots. Range approximately 2,175 nautical miles with long range tanks. In production from approximately 1939 to unknown. The Lockheed C-141 series was operated almost exclusively by the USAF, its reserve components, and National Guard units. A few did see service with NASA. The C-141A Starlifter often bulked out, filled with cargo, before it grossed out - reached maximum weight limitations so all A models were overhauled to C-141B models by stretching the fuselage over 23 feet. During the overhaul the aerial boom refueling receptacle was added increasing the Starlifter's capabilities. Many Vietnam Veterans know the Starlifter series and The Freedom Bird. Besides supporting military actions in South Vietnam the C-141 was used to transport all of the POWs out of North Vietnam to Clark Airbase in the Republic of the Philippines. The Starlifter series was retired by the USAF in 2004 while reserve and National Guard units still fly the C-141B. The B model could carry up to 205 troops in "very cheap airline style" seats, 168 paratroopers in web seats, 103 litters as a medivac aircraft or 13 standard military cargo pallets. Approximately 65 C-141Bs were modified to C models in the 1990s. This gave them a glass cockpit and improved avionics and navigation systems. As a passenger I flew in the back of the C-141Bs numerous times. Cold and uncomfortable. Allowed to tour the cockpit occasionally, it looked and was flown as an airliner. Most of my crews were reservists flying airliners in their other jobs. Wing span approximately 160 feet. Empty weight approximately 148,120 pounds. Maximum weight approximately 343,000 pounds. Useful load approximately 194,880 pounds. Powerplants - 4 Pratt & Whitney TF-33 turbojet engines with 21,000 pounds of thrust each. Maximum speed approximately 490 knots. Cruise speed approximately 430 knots. Range limited only by crew and engine oil with aerial refueling. In production from approximately 1963 to 1968. The Lockheed F-104 Starfighter was one of the models we had to have as a kid. The airplane is basically a container for the General Electric J-79 engine accompanied by a pilot. The McDonnell F-4 Phantom II uses two of the GE J-79 engines. While a distinctive aircraft in the USAF inventory, it was more popular with foreign governments than with the U.S. government. Designed by Kelly Johnson in the Lockheed Skunk Works along with other notables such as the U-2 and SR-71. The Starfighter was the first aircraft to hold time to climb, speed, and altitude records at the same time with flights exceeding 100,000 feet and speeds in excess of 1,220 knots on a closed course. A time to climb record included a controlled flight to 82,000 feet in 266.03 seconds, just under 4 minutes and 45 seconds. While on vacation in Tucson, Arizona our "neighbors" were USAF F-104 pilots flying out of Davis-Monthan AFB as intercepters for the southern U.S. border. One of their comments was on take-off you were authorized Mach airspeeds - supersonic flight - for the intercept. As soon as the airspeed needle stopped increasing you had to turn to avoid overflying the border. At that point your intercept target was probably 20 miles behind you but it was fun. Germany flew the F-104 and a popular joke, due to their accident rate, was if you want a F-104 of your own, buy an acre of land and wait. It will come to you. Empty weight approximately 14,000 pounds. Maximum weight approximately 29,027 pounds. Useful load approximately 15,027 pounds. Powerplants - 1 General Electric J-79 turbojet engine with 15,600 pounds of thrust in afterburner. Maximum speed approximately 1,155 knots, Mach 2.01. Cruise speed approximately 475 knots. Range approximately 1,420 nautical miles. In production from approximately 1954 to 1983. The T-33 is another iconic jet. The T-33A Shooting Star is the two seat offshoot of the single seat P-80 / F-80 Shooting Star and the parent of the U.S. Navy T2V-1 / T-1A SeaStar. The P-80 was the first jet to enter full squadron service with the U.S. Army Air Forces shortly after WWII. The T-33A entered service as the TF-80C primarily as a transition trainer for already qualified pilots a short time later. The airframe is HEAVY. Overbuilt by 1990 standards and well built by 1950 standards. Seating in this bird gives you a feeling of security. Everything is solid and firm in a roomy cockpit. My college received several of them as donations to our maintenance program and we got to start, taxi, and maintain the non-flyable by agreement, de-militarized (ejection seats disabled) airframes. The Allison J-33 engine is interesting. A centrifugal compressor taking in air from both sides. It "slings" the compressed air into the diffusers and burner can aft of the compressor. As such, there are two "compressor doors" on the top of the fuselage just aft of the cockpit. When you rapidly push the power level forward you can feel them thump back closed when inlet air catches up the to the engine's needs. Wing span approximately 39 feet. Empty weight approximately 8,300 pounds. Maximum weight approximately 15,100 pounds. Useful load approximately 6,800 pounds. Powerplant - 1 Allison J-33 Centrifugal compressor turbojet engine with 5,400 foot pounds of thrust. Maximum speed approximately 520 knots. Cruise speed approximately 360 knots. Range approximately 1,100 nautical miles. In production from approximately 1948 to 1959. The U.S. Navy modified the P-80C aircraft as TO-1 and changed that to TV-1 shortly thereafter. Lockheed also built the TV-1s for the Navy. These were redesignated T-1s. There are a number of differences in the appearance of the two. This is a Navy T-1A SeaStar at the Pima Air and Space Museum in Tucson, Arizona. While the similarity is apparent, it shows its many differences. As a carrier capable trainer, the T-1A had both a tail hook and speed brakes which were utilized to add drag so the engine remained in a "responsive" power range during landings appropriate to carrier operations. Another Kelly Johnson / Lockheed Skunk Works program, the SR-71 is the end result of the cancelled A-12 / YF-12 intercepter project. While there is much folklore about the Blackbird, or "Habu," a Japanese cobra family snake, there are most likely many untold true stories of SR-71 that surpass the folklore. Retired since the late 1990s the SR-71 still holds the fastest air breathing manned vehicle speed record. Its flight envelope, not "factually disclosed" is in excess of 80,000 feet comfortably. Designs which utilize stealth profiles explains much of the Blackbird's shape. The balance is explained by a flight envelope so low in density that if the human body is exposed to it the blood would boil due to the lack of pressure even in the extreme cold. This explains the justification for the "chin" of the Blackbird running to the nose. Interestingly, the SR-71 has a feature few, if any, other aircraft can claim. The faster it goes, the less fuel it burns. This is attributed to the way the intakes and the "continuous bleed" J-58 engine work together. Consider the engine basically becoming a very effective ram jet above about Mach 1.5. Where the SR-71s have flown, when disclosed, include over China and Vietnam on photo reconnaissance missions. Many European, African, and Asian continent countries have been overflown. Due to speed and altitude, no SR-71 has ever been shot down even though many have been fired upon. One of the SR-71 Blackbirds bases was Kadena AB, on Okinawa, Japan. Folklore says that the air police came out before a launch to preclude any photos. When I asked if I could take a photo of a take-off I was told, "Not a problem. There are probably 200 Japanese Nationals on the fence line taking them too." With that I took several pictures. One follows the March Air Field Museum photo. On later trips through Kadena I took movies of SR-71 takeoffs and landings. Wing span approximately 56 feet. Empty weight approximately 67,500 pounds. Maximum weight approximately 172,000 pounds. Useful load approximately 104,500 pounds. Powerplants - 2 Pratt & Whitney J-58 turbojet engines with afterburners capable of 32,500 foot pounds of thrust. Maximum speed approximately Mach 3, or in excess of 2,500 knots per hour at 80,000 feet. Cruise speed approximately Mach 3, or in excess of 2,500 knots per hour at 80,000 feet. Range approximately 2,200 nautical miles unrefueled, with aerial refueling limited by crew, oxygen, and engine oil. In production from approximately 1964 to unknown. Head-on the SR-71 Blackbird is thin and looks as evil as it looks powerful. The aft section photo shows the lack of shape to the airfoil that you would expect a high flier to have. This is a USAF SR-71 Blackbird taxiing shortly after landing at Kadena AB, Okinawa, Japan. The plane on the left is a Naval Air Facilities Kadena "station bird", a Douglas C-117. A DC-3 version with enclosed wheel wells, a straight tail, modified engine cowls, and some other differences. I also find references to this as the DM-21 being a joint Lockheed / Martin project and as Q-21 as a Lockheed project. This was an attempt at a reconnaissance drone that could be launched from the back of a Lockheed SR-71 during high speed supersonic flight. The D-21 had a camera system and Inertial Navigation System (INS) in a pack that was designed to be ejected in flight, retrieved by a "sky hook" type operations. After detachment of the pack containing everything sensitive, the drone was programmed to destroy itself. Due to the modifications necessary to the SR-71, the launch Blackbird was redesignated M-21 for "Mother" with the drone being designated D-21 for "Daughter." Carried between the two vertical fins of the M-21 on a centerline pylon. The control of the drone for launch was done from the rear cockpit by the Launch Control Officer. The first test flight was successful. The second was a failure due to a hydraulics system failure. An electronics package failed on the third test flight. The fourth test flight resulted in the loss of both the M-21 and D-21 over the Pacific when the D-21 impacted the right wing of the M-21 at over Mach 3. The M-21 broke apart and both the pilot and LCO ejected. Pill Park, the pilot, survived while LCO, Ray Torick, died as a result of the injuries received in the break-up and high speed ejection prior to rescue. The D-21 was modified with a solid fuel rocket motor to propel above Mach 2 after being launched from a modified Boeing B-52 Stratofortress. Four operational flights over the People's Republic of China were conducted. None were successful as the drone or the data pack malfunctioned. In the one that did not, the U.S. Navy recovery ship damaged the pack floatation system which sank before recovery. There is folklore that the D-21 was supposed to be a decoy drone for the SR-71. I cannot find any reputable sources of such a statement. Wing span approximately 19 feet. Launch weight of approximately 11,000 pounds. Powerplant - 1 Marquardt RJ43-MA-20S4 ramjet, 1,500 foot pounds of thrust. Maximum speed approximately Mach 3.35, 1,920 knots. Range approximately 3,000 nautical miles. In production from approximately 1964 to 1971. Built by LTV (Ling-Temco-Vought), the A-7 series of aircraft entered development through Navy funding as a derivative of the Vought F-8 Crusader with the intent of replacing several U.S. Navy aircraft including the propeller driven Douglas A-1 Skyraider and aging A-4 Skyhawk single-engine, single pilot jet. Through technology available at the time the Corsair II was the first combat aircraft to be equipped with a HUD (Heads-up Display), an INS (Inertial Navigation System), and a turbofan engine rather than the pure turbojet. A turbofan bypasses (pushes) some of its air intake around the engine core rather than through it, a common feature on most jet engines in operation today, a rare sight in the 1960s. The A-7 Corsair II, having a rounded nose, has a shorter and broader body, with a greater wing span without the variable incidence of the F-8 Crusader. As a replacement for the Douglas A-1 Skyraider and Douglas A-4 Skyhawk this meant from the start the LTV A-7 had to be carrier capable and compatible with current U.S. Navy operations. By design the A-7 Corsair II uses a probe and drogue refueling system. All of the U.S. Air Force and National Guard A-7s that I saw have the standard U.S. Air Force boom and receptacle system. This requires a modification you can see in many Internet photos on the top, left side of the fuselage at the leading edge of the wing. In carrier use the A-7 was frequently assigned a portion of the tanker (inflight refueling) role. With the use of buddy store, the A-7 becomes a tanker aircraft with several thousand pounds of "give" fuel. Plus, it can consolidate other airborne tankers into its available transfer fuel. As the A-7A went through improvement programs you will find models through the A-7E and numerous twin seat versions used for training and transition. These improvements include a more powerful engine and additional mission oriented electronics. Empty weight approximately 19,125 pounds. Maximum weight approximately 42,000 pounds. Useful load approximately 22,875 pounds. Powerplant - 1 Allison TF41 turbofan engine with 15,000 foot pounds of thrust. Maximum speed approximately 600 knots. Range approximately 1,100 nautical miles on internal fuel. In production from approximately 1965 to 1984. At the time of acquisition, the B-57 was one of the few U.S. Air Force aircraft designed from or licensed from a foreign aircraft. The B-57 / EB-57 is based on the British Electric Aviation Canberra. 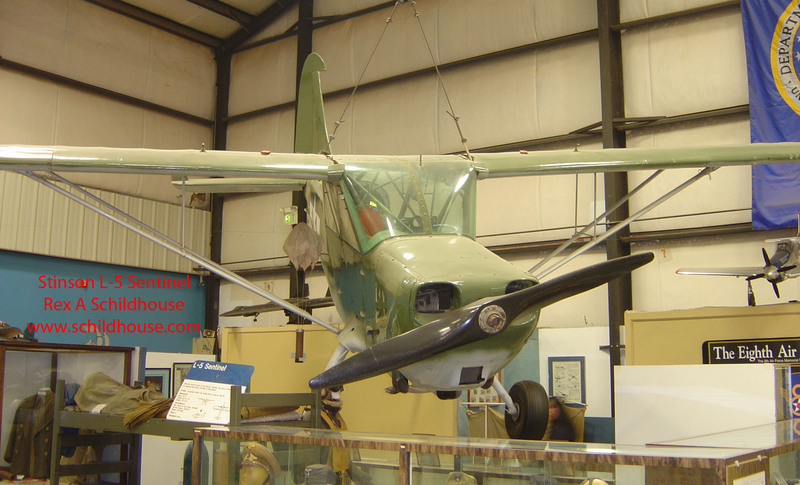 The Glen L. Martin Aircraft Company made numerous modifications during its transitional design work. One of the modifications was to install bomb bay doors that rotated into the fuselage rather than extend into the air stream. Other modifications included a crew change from three to two and wing tip fuel tanks. With straight wings and jet engines the aircraft is a true high flyer while restricted to less than transonic speeds. There are claims that the B-57, adopted just after the Korean War, become the first U.S. jet bomber to drop bombs in combat. Upon entry into the Vietnam War the performance and survival of the B-57 was lacking. Numerous B-57 Canberras were modified to electronic surveillance and warfare, photo reconnaissance, and weather reconnaissance. Due to the overall strengths of the basic design at least a few B-57s were built or modified with substantially greater wing spans for higher altitude flights. While flying the North American Rockwell T-2C Buckeye I ended up being parked next to a B-57 from the Green Mountain Boys of New Hampshire National Guard. One of their jokes was that they were not real fast, real pretty, or real fancy but when someone joined up on their wing they simply climbed them out of their flight envelope. I made the comment that we had flown in at Flight Level 455 (45,500 feet above sea level), VFR on top, due to the limited air traffic control services in the early 1980s. The crew responded with something like, "We consider that to be the mid altitudes." I do not think I could get a T-2C to FL 460. Wing span approximately 64 feet. Empty weight approximately 27,100 pounds. Maximum weight approximately 53,720 pounds. Useful load approximately 26,620 pounds. Powerplant - 2 Wright J65 turbojet engines with 7,220 foot pounds of thrust each. Maximum speed approximately 520 knots, Mach 0.79. Cruise speed approximately 415 knots. Range approximately 2,360 nautical miles on internal fuel. In production from approximately 1953 to 1957. I will stick with the title McDonnell F-4 Phantom II. The aircraft was designed and initially built by McDonnell before the McDonnell-Douglas merger in 1967. I have never seen a "McDonnell-Douglas F-4 Phantom II" patch. For many years this was the frontline U.S. Navy, U.S. Marine Corps, and U.S. Air Force fighter as was used by both the Thunderbirds and Blue Angels Flight Demonstration Teams. Over 5,000 F-4s in various configurations were manufactured, many, if not all, were built at Lambert International Airport near St. Louis, Missouri. Modifications and overhauls were accomplished at numerous commercial contractors and military aviation depots throughout the world. The F-4 Phantom II comes in numerous versions and with numerous specialties. U.S. Marine Corps squadron VMFP-3 flew the RF-4B with every drag generating feature of the aircraft addressed making it the fastest F-4 assigned to the USS Midway. U.S. Air Force squadrons flew an F-4 modified for Wild Weasel missions which baited surface-to-air missile sites and then tried to destroy them with air-to-ground missiles. While designed for air-to-air combat, the F-4 demonstrated its versatility as a good air-to-ground bomber as well. Some USAF versions carried built in mini-guns while the Navy and Marine Corps experimented with mini-gun pods. Ordinance capabilities of the F-4 are vast. Many Phantoms II were built with 4 Sparrow air-to-air missile wells in the bottom of the fuselage. Wing and centerline hard points accepted fuel tanks, missile rails, bomb racks, and surveillance pods. To address some of the distinctive features of the Phantom II, the outer wing panels are tilted up by 12 degrees to provide better lateral / roll stability. The 23 degree anhedral of the horizontal flying tail improves high angle of attack stability and control. The ramps in front of intakes are for supersonic flight air flow control into the engines. In a presentation given at my aviation school a McDonnell-Douglas rep said that Navy/Marine Corps vs. USAF/National Guard F-4 Phantom IIs included the wing spar and landing gear due to the carrier arrested landing capabilities required by the Navy/Marine Corps. He stated that the Navy wanted a Maritime Air Superiority aircraft capable of protecting the battle group underway. The phrase "Maritime Air Superiority" would arise with the Grumman F-14 Tomcat. Empty weight approximately 28,275 pounds. Maximum weight approximately 58,000 pounds. Useful load approximately 29,725 pounds. Powerplant - 2 General Electric J79-GE engines with afterburners furnishing 17,000 pounds of thrust each. Maximum speed approximately 1,460 knots, Mach 2. Cruise speed approximately 510 knots. Range approximately 1,375 nautical miles on internal fuel. In production from approximately 1958 to 1981. Initially designed and built by McDonnell-Douglas before the Boeing acquisition, the F-15 is still being produced for foreign military service contracts by Boeing (2014). Production is expected to terminate in 2019. Service life extension programs (SLEPs in Navy lingo) may take the Eagle into the late 2020s. The F-15 is in service with the U.S. Air Force and National Guard units as well as numerous foreign governments. Its primary deployment is air-to-air, its utilization in an air-to-ground role for U.S. forces has been very minor. Making some assumptions based my knowledge, the Air Force wanted a smaller, more versatile fighter than the very large, fuel guzzling McDonnell F-4 Phantom II. With electronics assisting the single pilot the F-15 Eagle became an all weather fighter with outstanding maneuverability. Later modifications included a two-seat, dual role aircraft adding deep interdiction to the air-to-air combat role. Equipped with an internal M61 Vulcan 20 mm mini gun, the F-15 Eagle also carried the AIM-9 Sidewinder, AIM-7 Sparrow, and AIM-120 AMRAAM (Advanced Medium Range Air-to-Air Missile). Wing span approximately 43 feet. Empty weight approximately 28,000 pounds. Maximum weight approximately 68,000 pounds. Useful load approximately 40,000 pounds. Powerplant - 2 Pratt & Whitney F100 turbofan engines with afterburner providing 17,000 foot pounds of thrust each. Maximum speed approximately 1,435 knots, Mach 2.5+ at altitude. Range approximately 1,060 nautical miles on internal fuel. In production from approximately 1972 to present. Looking at most Soviet / Russian fighters you need to find out where it was manufactured as it is common to license manufacturing to other cooperative governments. You can find the Migoyan-Gurevich MiG-19 also as the Shenyang J-6 and the Nanchang Q-5 due to Chinese manufacturing and as the Avia S-105 when manufactured in Czechoslovakia. Because most licensing efforts also had licensed engines as well as electronics modifications performance could be similar or significantly different. Over 5,500 MiG-19s were built in the Migoyan-Gurevich facilities alone. The MiG-19 has a dramatic 55 degree sweep to its wings while its fuselage leads one to believe it is a single-engine aircraft. The twin engines of the Farmer pushed it to supersonic speeds in level flight for the first time in a soviet fighter. The Farmer was introduced to the North Vietnamese Air Force after Operation Rolling Thunder in 1968. It was used in air-to-air combat during Operations Linebacker 1 and 2. Its combat victories were often attributed to the use of its three 30 mm cannons, the MiG-19 has no missile rails. In researching the MiG-19 I find it has a RB-47 kill over the Arctic Circle in international airspace, a T-39 Sabreliner kill over East German airspace, and an F-104 kill over China's Hainan Island. Wing span approximately 30 feet. Empty weight approximately 11,980 pounds. Maximum weight approximately 19,000 pounds. Useful load approximately 7,020 pounds. Powerplant - 2 Tumansky RD-9B turbojets with afterburners producing 7,180 foot pounds of thrust each. Maximum speed approximately 750 knots. Cruise speed approximately 420 knots. Range approximately 750 nautical miles. The Migoyan-Gurevich MiG-21 Fishbed C defies Western trends of designs, as numerous other products of the Migoyan-Gurevich design department do. The MiG-21 is a delta-wing design with a tail plane. Typical of Soviet technology, if you were an ally and wanted to build your own Fishbed C, license your production effort. Under license the Fishbed C was built in India, China, and Czechoslovakia. Russian manufacturing produced over 11,000 MiG-21s in various versions and it was deployed worldwide usually under the host country's flag. The MiG-21 saw combat in numerous theaters and accounts for numerous air-to-air kills. Both the Indo-Pak War of 1965 and 1971 would see MiG-21s involved. The Israeli Six Day and Yom Kipper wars both saw MiG-21 action. North Vietnam deployed the Fishbed with numerous claims of kills, many which cannot be verified. Part of this is the confusion of combat. Often the MiG-21 was up to the task for one simple reason. It has a pair of 30 mm cannons which were very effective at close range. Coupled with the subsonic speed and maneuverability the Fishbed was a true threat. When the MiG-21 was given missile capabilities such as the AA-2 Atoll, a reverse engineered AIM-9 Sidewinder the effectiveness of the platform increased with the constraint that it was still a basic, clear weather fighter while many of its advisories were all-weather capable. As of 2014, the MiG-21 Fishbed is still in use in numerous countries. India has announced it intends to fly its Fishbeds into the year 2025. Wing span approximately 23 feet. Maximum weight approximately 19,400 pounds. Powerplant - 1 Tumansky R25-300 turbojet engine with afterburner capable of 15,650 foot pounds of thrust. Maximum speed approximately 1,175 knots, Mach 2. Range approximately 655 nautical miles. In production from approximately 1956 to unknown. If you have a mechanical or engineering background, you need to study the main landing gear on this bird. Better pictures of it over on the Pima Air and Space Museum page. It appears to roll, fold, swivel, and tuck before retracting. The follow-on to the MiG-21 Fishbed, the Flogger had a more powerful engine and a newer electronics package as a response to what the McDonnell F-4 Phantom II has shown as its capabilities in Vietnam. The new and heavier fighter was going to present a problem for many of the satellites the Soviets supported as long runways could be required. To address that issue the Flogger is a variable geometry wing aircraft with the outer half of each wing panel pivoting. Due to technological changes in the design the Soviets were sensitive about the export of these new toys. To truly trusted allies of the Warsaw Pact, a slightly modified version was exported. To third world supported allies a significantly simplified version was exported. No licensed productions are mentioned. The MiG-23 Flogger has been in combat in such theaters as the Soviet attempted occupation of Afghanistan in the 1980s. It has fought against Israel, against Iran when deployed by Iraq, and was utilized by Libya to enforce it's line of death unsuccessfully when it challenged the Grumman F-14 Tomcat. Armament for the Flogger continues with the standard Soviet doctrine of a large caliber cannon, 30 mm, air-to-air missiles, and air-to-ground ordnance. With over 5,000 built, this complex and multi-purpose platform of fighter / bomber, the MiG-23 is being retired daily throughout the world with numerous airframes sitting in reserve in many areas. Wing span approximately 46 feet. Empty weight approximately 21,150 pounds. Maximum weight approximately 18,030 pounds. Useful load approximately 3,120 pounds. Powerplant - 1 Khatchaturov R-35-300 turbojet engine with afterburner with 18,850 foot pounds of thrust. Maximum speed approximately 2,125 knots, Mach 2.3. Range approximately 575 nautical miles. In production from approximately 1967 to 1985. Best known for the Doolittle Raid in which 16 B-25s proved that it is not runway length or ground speed which allows an airplane to fly but airspeed as they launched from the USS Hornet, CV-8, on April 18, 1942. Doolittle had a ground roll of 467 feet. Over 9,000 airframes of various versions of the B-25 were produced before production stopped. Most USAAF Mitchells saw action in the Pacific Theater of Operations. Exports during and after the war went worldwide. The versatility of the B-25 is apparent from its numerous modifications which went as far a mounting, and FIRING a 75 mm manually loaded cannon in its nose for strafing and ground attack. When the first installation did not yield the desired results, a different 75 mm cannon was installed. Many were removed for multiple fixed mount .50 caliber machine guns. On the Internet you will find pictures of B-25s with as many as four mounted heavy machine guns in the nose along with the 75 mm cannon. The slight gull wing between the fuselage and the engine nacelle implemented due to stability problems. Other production modifications included changes in the vertical fins. Due to war-time demands, no prototypes or preproduction models were ordered. Improvements and modifications were done on the production line and with field teams. The B-25 Mitchell was flown by the U.S. Navy as the PBJ-1H. Wing span approximately 68 feet. Empty weight approximately 19,480 pounds. Useful load approximately 15,520 pounds. Powerplant - 2 Wright R-2600, 14 cylinder supercharged radial Cyclone series engine with 1,600 horsepower each. Maximum speed approximately 235 knots. Range approximately 1,175 nautical miles. In production from approximately 1940 to 1945(?). North American Aviation F-100C Super Sabre was the first USAF fighter to attain supersonic speeds in level flight. Equipped with four 20 MM cannons and capable of carrying bombs, rockets, and missiles with it underwing pylons the Super Sabre was destined for a long life. Numerous models were developed with a wide variation of leading edge and trailing edge flaps. These gave the Super Sabre one of its enduring memories - The Super Sabre dance. The following link is a YouTube video. There are many explanations for the Super Sabre Dance and the one I learned in Aero was a combination of a very effective elevator and very powerful engine that put the airplane into a situation where the airplane was "dancing" on its exhaust thrust with the only real effective control surface being the elevator. The wings were acting as "slabs" against the air to keep the nose up and the rudder was shielded from airflow by the fuselage. Proposed recovery, not really affective, was lower the nose to allow the aircraft to accelerate and allow the wings to develop lift. Lowering nose a bit more resulted in the exhaust thrust "coming off the ground" and the dance ended with ground impact. The F-100 Super Sabre saw limited duty in Vietnam before it was replaced by aircraft which included the LTV A-7 Corsair II and McDonnell F-4 Phantom II. Empty weight approximately 19,720 pounds. Maximum weight approximately 36,550 pounds. Useful load approximately 16,830 pounds. Maximum speed approximately 800 knots. Cruise speed approximately 515 knots. In production from approximately 1953 to 1959. Designations for the Rockwell / Aero Commander vary greatly from L-26C to U-4A and U-9A. I have found several USAF aircraft of this basic configuration - twin-engine with 4 to 8 passengers called or referred to as "Blue Canoes." These include the Cessna 310 designated as the L-27B, U-3A, and U-3B. I have located two solid references that state the USAF name for the Rockwell / Aero Commander U-9 is "Aero Commander." Admission fee, check the museum homepage for current prices. Retired military receive a discount, their dependents so not. MapQuest and our Garmin GPS both said it was 58 miles from home to the museum. Unrealistic and not sure why they agreed on that answer, there is a Ramona, California in Riverside but it has a different zip code. They both showed 97 miles to the Palm Springs International Airport from our house, pretty much the same "sensing location." The museum in on the Palm Springs International Airport and the airport is not small but not that big either. Once we got underway our Garmin updated to something realistic in travel time, changing from 1:15 en route to 1:45. Then, at one turn it changed from arrival in 35 minutes to arrival in 1:20. And we had already been en route for over an hour and fifteen minutes. We had to make two stops en route to the museum via the back roads and it took us three hours to get there. On the way back we had to make three more stops and we took I-10 to the I-215 south onto the I-15, adding more than forty miles to the total travel distance in rush hour and it took us 3 1/2 hours. 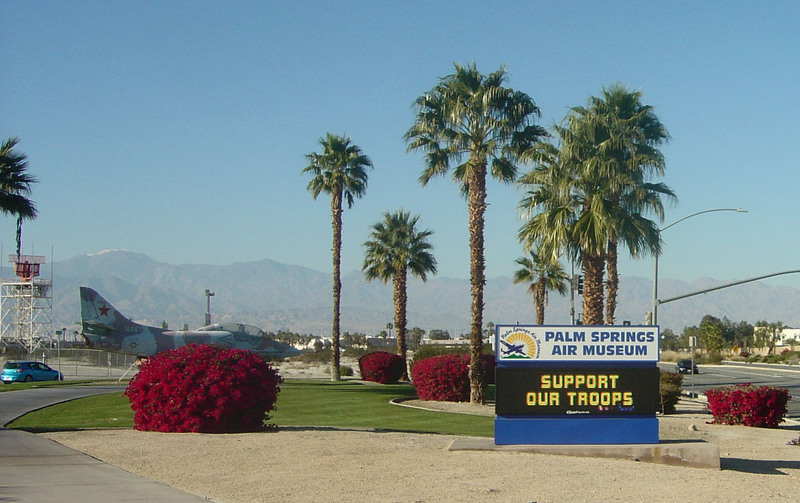 If you fly into Palm Springs in general aviation you will be parking about 1 mile southeast of the museum. We were there on December 29, 2014, and at 3:00 PM that afternoon it was 83 degrees in that clear sky environment. This museum is several hangars of aircraft and a large outside ramp area. The library and reference room, which are open to the public, is upstairs and air conditioned. The gift shop at the entrance is nicely equipped, about 25 x 30 feet with a fair amount of child and youngster materials on hand. The canteen in inside one of the hangars and a bit limited in the menu. I live with my food allergies but my Wife found nothing on the menu she wanted. The museum's numerous docents / volunteers were hit and miss. Most were very friendly, helpful, and well informed. A few were misinformed or less interested. One explained that Boeing made over 12,000 B-17 Flying Fortress' in its Seattle facilities during WWII. In reality, between 12,000 and 13,000 B-17s were produced between 1936 and 1945. The production efforts included including Boeing, Lockheed/Vega, and Douglas at locations such as Seattle, Washington, Wichita, Kansas, (possibly - conflicting info) and Southern California by companies that including Boeing, Lockheed/Vega, and Douglas. I asked another who was sitting in a group of volunteers and was directed with a finger point to a sign in front of the airplane - that I had already read. I notified a docent / volunteer that a sign was under the wrong airplane and he left immediately to correct it. Hit and miss. Mostly hit. Volunteers are expensive and hard to keep if they are good. Numerous flying condition aircraft on display. During our visit a North American T-28B Trojan went from display to the air. It was great hearing that R-1800 roar through the air again. We visited on Monday, December 29, 2014. A BAD day for a photographer and a GREAT day for the museum. A lot of people and many of my pictures had other visitors in them. The museum is worth the visit. We spent three hours there and that is probably a good tour time. One docent stated the Navy has been more than generous with support and the loan of aircraft. Here is a General Dynamics F-16N Fighting Falcon manufactured specifically for Top Gun. A Grumman A-6E Intruder all weather carrier based attack bomber. The museum is crowded with airplanes making good photography a trial. I finally gave up with over 275 photos taken. Here is a Grumman F7F Tigercat. The photo is taken through the wings of a Stearman PT-17. The best I could get of a fantastic airplane. When we moved into Ramona, California there was a Tigercat at the airport under restoration. It NEVER looked this good. Someone really loves this airplane. 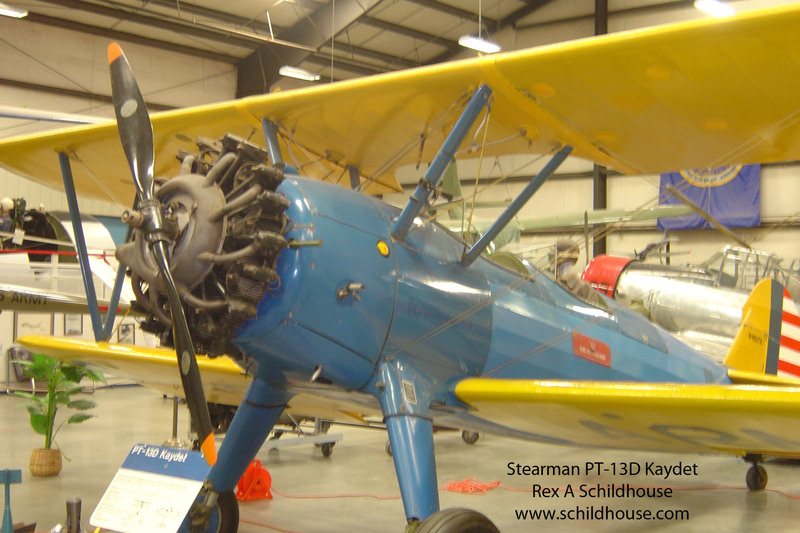 Stearman (Boeing) PT-17 N2S or Kadet. This plane was virtually flawless. In this photo I included the hangar wall painting of a Vought F4U Corsair landing on the USS Essex, CV-9. While a SMALL portion of the mural is obscured, it would nice to have it all. The Lockheed F-104 is one of those airplanes does does not project strength, might, or power in the way of "I can bomb you to oblivion." It radiates pure speed very effectively. Joyce gets to drive me to these types of places. I cannot say this the way she would like to spend her day. She is standing in front of the intake for a General Electric J-79 turbojet engine with an afterburner. Forget the barn door. This engine can take the whole barn vertical. The McDonnell F-4 Phantom II has two of them. Specifications for this engine list over 17,500 foot pounds of thrust in afterburner. To say that there is one single airplane or display that is the pride of the museum would be false. This is an excellent presentation of the Douglas SBD Dauntless. No matter how I moved, I missed some feature of the Dauntless. This compromise took off the prop dome. Grumman F6F Hellcat. If you are wondering, Leroy Grumman stated in an interview that he decided that the rear folding wings common to many of his Cats, and a few other Grumman aircraft were inspired by a bent paperclip while pondering a problem at his desk. 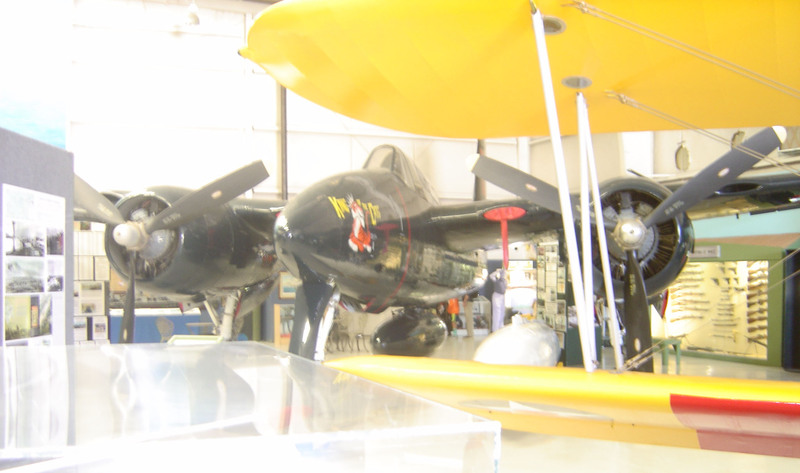 Some of my numerous bad photos, the museum has a Grumman F8F Bearcat in excellent condition. The Palm Springs Air Museum has EXCELLENT signage in quality, accuracy, and information and EXCELLENT lighting inside the hangars. Often the signs and lights conflict with each other. There were virtually no shadows in the hangars and a lot of reflections. Even the outside signage is in good repair. 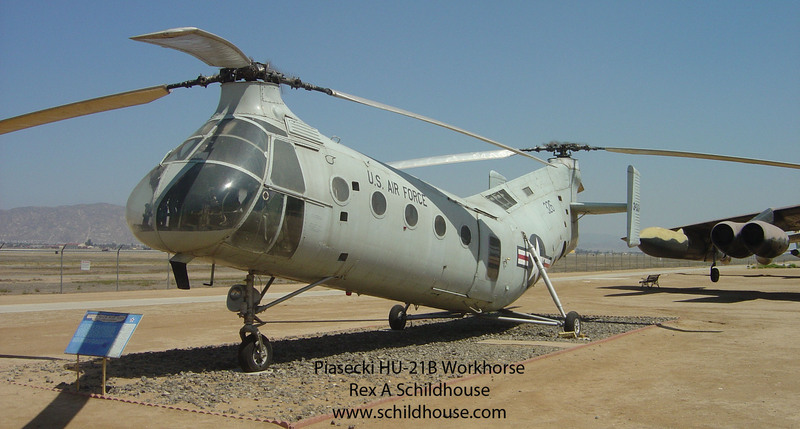 The Sikorsky H-34 Choctaw is an iconic helicopter and is one of the aircraft that spawned the helicopter war of Vietnam. I wish this bird had its Wright R-1820 9 cylinder radial engine with 1,525 horsepower installed and visible. The drive shaft goes up, between the pilots. The F-4 was originally designed, contracted, and delivered by McDonnell. After deliveries commenced McDonnell and Douglas merged. I keep with the "McDonnell F-4 Phantom II" statement. In the fleet I never saw a single "McDonnell-Douglas F-4" patch. An icon of power and superiority and scientific proof that if an airframe designer can design a barn door with wings a powerplant engineer can create the necessary engine. Inside an F-4 are two General Electric J-79 engines. When their afterburners ignite you hear them six city blocks away. This is an "S" model F-4, probably the last major modification to the Phantom II by the U.S. Navy. The leading edge slats were supposed to improve its turning capabilities and landing ease according to the fleet pilots who flew them off the Midway while I was flying the C-1A. This is a showroom piece of work. The Republic F-105 Thunderchief is one of the numerous aircraft that served in Vietnam. It has always amazed me at how high this airplane is. At Bergstrom Air Force Base, Austin, Texas, I was talking to some Texas National Guard pilots flying the bird. They said its height was so it did not drag its tailpipe on takeoff and landing. The U.S. Air Force stayed with guns and cannons on their aircraft while the U.S. Navy shifted to air-to-air missiles. This is the F-105's 20 MM M61A1 Vulcan Gatling cannon with six barrels. it has been installed on numerous other aircraft. Not visible in the photo are the numerous hard points on the wings for ordnance. The F-105 was air-to-air and air-to-mud throughout its life. George W. Bush flew F-105s in the National Guard as I understand it. The Lockheed PV-2 Harpoon was a late entrant into WWII. At the end of the war massive contracts were cancelled, which included large numbers of the Harpoon. 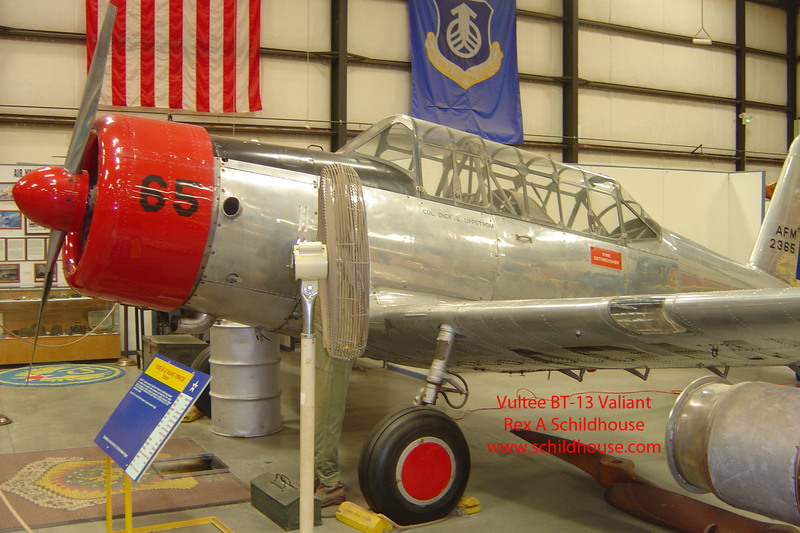 There are several PV-2s on display in museums, this one is pristine. This is also a good example of missing your subject for the total picture. The Harpoon sitting on the ramp with the mountains in the background were simply beautiful. I think these are the San Jacinto Mountains, due west of Palm Springs. The airplane photo should have been another 10 degrees to the left. Sorry. It was a beautiful day in Palm Springs, wish it had been clearer. At one point in time nose art was one of the things that made the plane the property of the air and ground crews, giving them pride of ownership. In the modern, PC society, U.S. Military nose art would be called criminal and result in a court-martial. The Grumman C-1A Trader. A beauty from days gone by. I have over 800 hours in the trusty C-1A and over 125 in its sister, the TS-2A Tracker, about 20 hours short of a total of 1,000 hours. With two Wright R-1820 Cyclone nine cylinder radial engines the Trader never turned into a Traitor on me. I trusted her with my life without regret and I have a number of traps in her and her sister on the Lexington and the Midway. The C-1A is a pilot's airplane. To give you a feeling of the size of this fun airplane, Joyce is looking inside. My seat was usually up front in the right seat as instructor and evaluator. I flew the North American T-28B and C model Trojans at VT-27 in NAS Corpus Christi, Texas in 1975 and 1976. This was like old home week. This picture was taken of Joyce in 1975 at Naval Air Station Corpus Christi, Texas while I was assigned to VT-27 flying the North American T-28B and C Trojans. The preceding photo was taken in 1975. This photo was taken in 2014. Joyce helped me through Naval Aviation Flight training. She learned the pre flights, emergencies, and maneuvers as well as I did. She still remembered the prop governor check 39 years later. I was ready to fly. About an hour after this photo was taken the T-28B Trojan was back in the air. It sounded great. The Douglas C-47 Skytrain, or Dakota to the Canadians and Brits, was my Dad's ride into numerous combat situations as a member of the 101st Airborne Division's Screaming Eagles. This one looked like it was being readied to load a stick of paratroopers and wing its way off to war. There is a forward section of a Fairchild C-119 Flying Boxcar open for viewing. Photos from an aviation era of the past. The Bell UH-1 Iroquois, commonly called the "Huey" for an earlier designation of "HU-1" was the first U.S. Military turbine powered helicopter. It proved many concepts within the helicopter war of Vietnam and was a significant element in the Critical Hour for combat injuries. The UH-1 flew and fought. Displayed in this manner, the 7.62 NATO M60 and the rocket pods, prove that. Many news clips from the Vietnam War showed these in use. Before helicopter operations in instrument conditions became "every day events" the UH-1 was a bare bones instrument panel. The pilot in most helicopters sits in the right seat to protect his left arm on the collective. Fixed wing aircraft, the instrument panel usually favors the left seat. The Bell AH-1 Cobra is a derivative of the Bell UH-1 Iroquois after lessons learned in the early days of Vietnam. A dedicated gunship in which the pilot flew from the back seat allowing the copilot / gunner better visibility for weapons operations from the front. The AH-1 was equipped with a steerable weapons turret under the nose which contained a mix of either two 7.62 MM NATO mini guns or one mini gun and a grenade launcher. The "wings" or pylons carried a variety of rocket pod options. The AH-1 Cobra, often called the Huey Cobra based on its heritage, is a two place helicopter. At least one downed airman rode out sitting on the skid or belted to the wing / pylon to avoid capture in Vietnam. The Grumman EA-6B Prowler is tactical electronic warfare in the strike group. A four place airplane, single pilot position front left, three Naval Flight Officers in the remaining three seats, completed its crew. My first tour on the Midway was with a VMAQ-2 detachment, U.S. Marines flying the EA-6A "Electric Intruder." The Midway "upgraded" to VAQ-136, a Navy squadron flying the EA-6B. While the A-6 series, EA-6A, and the EA-6B all look alike, until you park the EA-6B next to its older sisters, it appears that they all spring from one airframe. Not so according to the Grumman reps I worked with. The Prowler has the appearance but the size in all modes and codes changed allowing few common parts. This is a HUGH airplane. The Palm Springs Air Museum has done some really nice work with their aircraft and displays. They may have received this Prowler with 4 external fuel drop tanks and simply left it that way. I ever saw a Prowler fly without at least two electronics warfare pods and usually with at least three. The Soviet bloc aircraft began flooding the free world after the fall of the iron curtain. Jet trainers such as the Czechoslovakian Aero L-29 Delfín and L-39 Albatros aircraft were being sold in flyable condition for less than some used general aviation aircraft and trainers. Mikoyan-Gurevich (MiGs) and Sukhoi manufactured fighter aircraft were not excluded and soon made their way into the U.S. The signage says this MiG-21 Fishbed was donated to the Museum by Ms. Libuse (Lilly) Hornak, the widow of Mr. Stefan Hornak, a MiG collector. If you follow Soviet aviation developments you will see that many of their combat aircraft were short range with adequate weapons to pose a significant threat over the Mother Country. However, considering that they were exported to just about every nation that agreed to list the Moscow area code in its business telephone book, you could find Soviet front line fighters anywhere. And for most likely small fees or pledges of allegiance, you could probably get a production license. If you search the Internet for MiG-21 service you will find that there hardly an incident where two countries got made at each other since 1965 that a Fishbed did not play a role. Most aircraft are not "single role." This is the folding fin rocket pod carried by the Fishbed C in an air-to-mud role. Initially designed for air-to-air service its lack of performance converted it to other uses. The orientation of the pods for the display is backwards, the missiles fire from left to right, the "barrel openings" are the exit points of the missiles, to the right of the display. I tried to get a good shot of the cockpit. The museum has a ladder at the side of the airplane. This is one cluttered cockpit. It looks like it was basic and functional in 1960 and then every technology change added another box, knob, dial, or indicator. A North American F-86 Sabre being restored. The Consolidated PBY Catalina was the savior of many downed airmen during WWII. The intel people had broken the Japanese Naval Code early in WWII and they knew the next major offensive was facing those on the island of Midway. The PBY was the plane that located the Japanese Fleet and gave the four U.S. aircraft carriers the edge. The Japanese lost the aircraft carriers Akagi, Kaga, Soryu, and Hiryu as well as one heavy cruiser. The U.S. lost one aircraft carrier and a destroyer. Six months after the attack on Pearl Harbor the tide of the war changed direction, assisted by a PBY and its crew, lead by Ensign Jack Reid. Note on the Battle of Midway, June 4 - June 7, 1942. My Father participated in the combat in the Aleutian Islands during the Battle of Midway as a member of the U.S. Army. I served 5 1/2 years on the U.S. Navy aircraft carrier named in honor of that battle - While it was homeported in Yokosuka, Japan. The Midway is now a museum in San Diego, California. On her deck are two airplanes I flew. The museum is active. In the back is another Bell UH-1 Iroquois. In the front is a Cessna 337 Skymaster. I am assuming from its paint that it was a fire fighting spotter at one time so it is most likely a military surplus O-2. I do not see the telltale antenna across the top and the additional windows are not visible on the right door. However, it is minus prop spinners on both engines so ... just guessing - what a lot of pilots called "the Super Bird dog," O-2. The museum has a flying B-17 Flying Fortress. Pretty cool! And you can walk through it for a small fee. PAY THE FEE!! The docents / volunteers onboard were very gracious and pretty well informed. Expect minor issues with volunteers. This airplane looks, feels, (does not smell) like a combat aircraft. Much of the insides have been restored to combat service condition. It is supporting .50 caliber Browning machine guns at many of its ports. I could have dreams of being in the right or left seat for takeoff of this beauty. The office space of the tail gunner. He looked through a sighting mechanism to fire his guns. One of the most hazardous positions in the Flying Fortress since most attacks were either head-on or diving into the tail type attacks to avoid the top turret field of fire. The bombardier/nose gunner's office space. A great view of the war from this position. The bomb bay of the Flying Fortress surprised me. I know with four Wright R-1820 Cyclone supercharged 9 cylinder radial engines producing 1,200 horsepower each you cannot carry a lot. This is SMALL!! Interesting catwalk concept. The Flying Fortress was well defended with .50 caliber machines - 2 in the nose, two on top, 2 in the belly, one on each side, and 2 in the tail. It is nice to see a B-17 "carrying her guns." Air-to-air gunnery is a science. The additions to these Browning .50 caliber machines show it. The long cables coming up from the lower left to the sighting mechanism are interrupters which preclude a gunner from shooting his own plane. They do not stop him from shooting other friendly planes. Friendly fire was not a Desert Storm creation. The belly turret of the Flying Fortress was retractable for takeoffs and landings. Quite a view and quite a target while occupying this position. The Bell P-63 Kingcobra was the follow-on to the Bell P-39 Cobra. The airplane has several interesting features, only a few visible. The V-12 Allison V-1710 liquid-cooled engine producing 1,800 horsepower is mounted mid ship - just behind the pilot, with the prop shaft running under the cockpit floor. The 20 MM cannon fires through the center of the prop. The cockpit door opens like a car door, and it is "tricycle gear." Its armament also included 2 .50 caliber machine guns firing through the prop and two more firing from the wings. Very nice work on this P-63 by the museum staff. Probably the best I have seen in any museum. The Lockheed T-33A Shooting Star is the first jet I ever got to start. Powered by a very interesting (now a days) Allison J33 dual inlet centrifugal compressor turbojet. 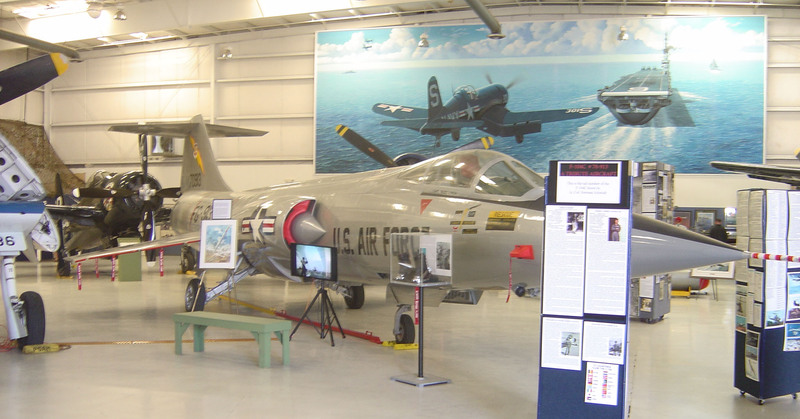 The T-33 is a derivative of the Lockheed F-80 Shooting Star. It would be great if the museum could put an Allison J-33 on display. An extremely interesting construction. Also, just for kicks, would be nice to show the "thumper doors" on the back of the Shooting Star. Interesting that they were needed. It seems everyone knows the Piper Cub. At airfields it is not uncommon for pilots to identify just about any small airplane close in appearance as a Cub. The U.S. Military used a number of small, general aviation aircraft in the observer, messenger, local logistics role. This is a beautiful Cub identified as an L-4 Grasshopper. Absolutely beautiful mural on the wall in the background. The Douglas A-26 Invader was stuck in a corner, fenced in by several other planes. I could not get a good shot of it. My other shots did not turn out due to glare. Notice the lack of shadows, great for better photographers than me. The North American B-25 Mitchell bomber proved to the Japanese that they had awaken the sleeping giant as the Doolittle Raiders bombed Japan just over 4 months after the sneak attack on Pearl Harbor. On the aircraft carrier we would say "wedge the big wings into the corners and then bury them." And the Mitchell is buried. Powered by 2 Wright R-2600 Twin Cyclone 14 cylinder supercharged radial engines with 1,700 horsepower, the B-25 was a fast plane for its day. Blocking the B-25's right wing is a Supermarine Spitfire. The restoration work is pleasing. The TBF / TBM Avenger is sitting in one of the main display hangars. 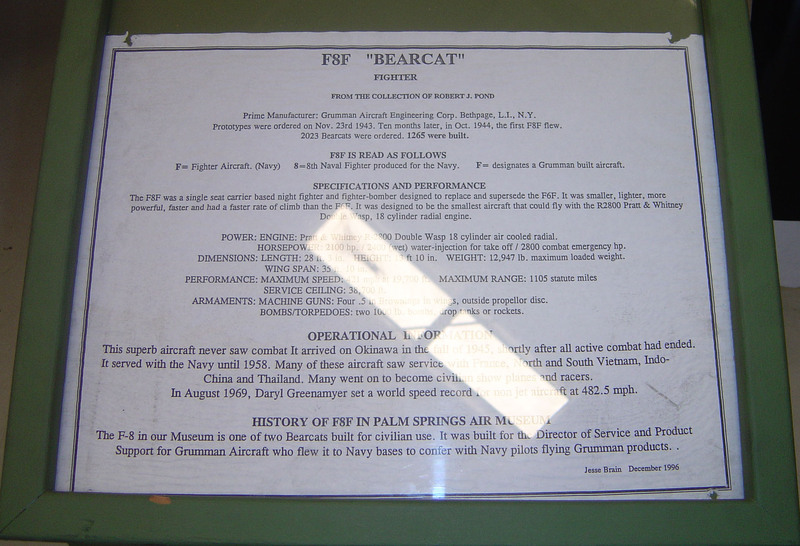 The signage, a significant asset at the Palm Springs Air Museum addresses why this is a TBF or TBM. This torpedo/bomber series was designed by Grumman. The mission, torpedo/bomber defined the first 2 letters - "TB." The last letter defined its manufacturer, not designer, as many aircraft were built by multiple firms. TBFs were built by Grumman and TBMs were built by Eastern Aircraft Division of General Motors. There were often design modifications between companies to fit their own manufacturing capabilities. A true general aviation airplane!! I am making guesses on this one with some degree of knowledge. Somewhere between 1960 and 1964 based on the swept tail and the straight-back lack of "omni-vision" fuselage. The exact year determines whether it could be called a Skyhawk or not but most Skyhawks were upgraded 172s with wheel pants and better interiors. The difference was the 172 was marketed to flight schools and the financially stressed while the deluxe Skyhawk was marketed to the businessman and financially secure family. Someone has put a lot of work into keeping this airplane pretty. This is a Wright R-1820 Cyclone radial engine. Many radials, because of their round basic shape, were supercharged with a centrifugal compressor mounted on the back side of the engine. Trivia - WWI had a lot of "rotary engines." 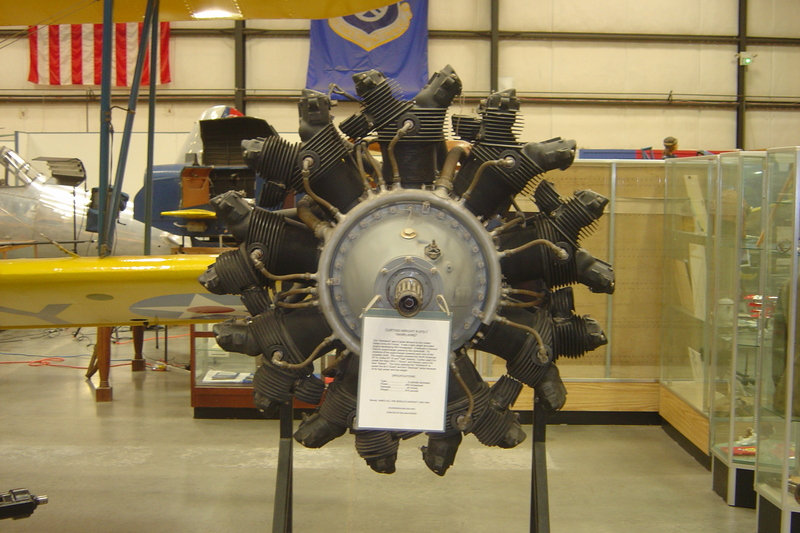 The rotary engine had the crankshaft mounted to the fuselage and the prop mounted to the engine mass. The entire engine spun and you had 2 power settings in most - Ignition On and Ignition Off. The gyroscopic affect of this moving mass influenced the maneuverability of the airplane as well. They were great for making turns added by gyroscopic affect and reluctant to turn against it. The San Diego Air and Space Museum has a working demonstration of a 1916 Le Rhone 9C9 rotary engine on display. Trivia - All rotary and radial engines have an odd number of cylinders per bank. Otherwise they could "deadlock" at top dead center and bottom dead center on opposing cylinders. 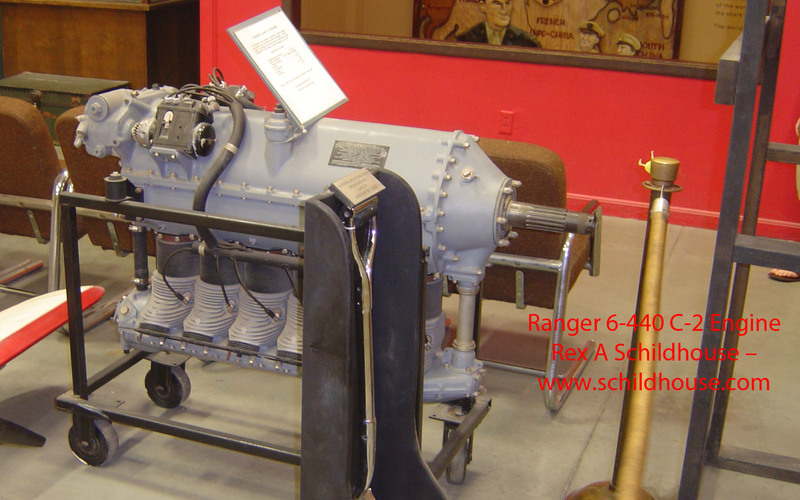 The Pratt & Whitney R-2800 Double Wasp engine is a 2 bank 18 cylinder radial with 9 cylinders per bank. While many will say it is two 9 cylinder engines bolted that is incorrect. The engine block is a unique piece. However, many multiple bank radials did use common cylinder assemblies from single bank engines. The R-2800 powered such notable aircraft as the Curtiss C-46 Commando, Douglas A-26 Invader, DC-6 / C-118 Liftmaster, Grumman F6F Hellcat, F7F Tigercat, and F8F Bearcat, Lockheed PV-2 Harpoon, Martin B-26 Marauder, Northrop P-61 Black Widow, Sikorsky CH-37 Mojave and S-60, and the Vought F4U Corsair. The Rolls-Royce Griffon with its centrifugal supercharger is a liquid cooled V-12 with 2,240 cubic inch displacement producing as much as 2,200 horsepower. There were numerous V-12 engines produced in the late 1930s into the 1950s. Confusing them is easy as they all look alike. So I go by signage. This engine was common to some variations of the Supermarine Spitfire and Seafire. It was equipped with a counter-rotating engine in the Avro Shackleton patrol bomber. I am going with "Rolls-Royce Griffon" vs. "Rolls-Royce Griffin" as I find more professional references to "Griffon" than "Griffin." The Griffin is a mythical creature which parallels the Rolls-Royce Merlin, the Griffon is a Dutch bred hunting dog. Rolls had a tradition of naming engines after birds of prey so ... Where is the break in tradition? This is a photo of an Avro 696 Shackleton patrol bomber at the Pima Air and Space Museum in Tucson, Arizona. Note the counter-rotating props. It seems that many of the walls of the hangars are painted in fantastic, high quality, exquisite detail murals. Here are some of the shots. I intended to take more, however, the pain level exceeded my tolerance so the day ended. There are excellent dioramas throughout numerous sections of the museum. Here are a few of them. If someone sent them up during the time of war, chances are someone else wanted to bring them down. This is a German 88 MM FLAK Anti-Aircraft / Anti-Tank gun, FlaK 36. Its shell could accurately reach 25,000 feet and randomly reach 42,000 feet. Allied bombers and fighters ranged in altitude from 15,000 feet to 32,000 feet. "Flak" is a term the Allies used for what the Axis forces were using to defend their fortress. It comes from the German FLugzeugabwehrKanone, anti-aircraft gun cannon also cited as Flugabwehrkanone. Shell detonation occurred at one of two times for the Axis powers - flight time or impact. At the end of flight time the shell exploded into many small pieces that the enemy aircraft flew through inflicting harm to crews and damage to equipment. The Allies acquired the U.S. designed proximity fuse during WWII which exploded the shell as it neared a target. According to documentation I can find, and I would believe it as logical, Flak brought down more Allied aircraft than Axis fighter aircraft. Flak is cheap, longer lasting, and does not take a year or more to train. Imagine your B-17, B-24, or Lancaster is at 24,000 feet penetrating the industrial heart of Germany under the control of the Norden Bombsight and the bombardier/nose gunner through the autopilot. You cannot take physical control of your plane and you are watching those black clouds of shrapnel patterns directly ahead of you from the anti-aircraft batteries tens of thousands of feet below you. You are sitting there watching someone else and a machine fly your life into a cloud of death. That takes stamina and guts. To be effective you cannot simply lob shells into the air. There are several issues some readers and viewers are not aware of. When a round is defined as something like "88 MM" that defines the diameter of the bullet or projectile. This picture appears to be two different 88 MM rounds. I believe the rear round is a high-explosive round, most likely anti-tank type usage. The front is a different round, not interchangeable with the rear. This situation was not unique to the Axis powers. The U.S. has a .30 caliber service rifle common called the Garand firing the .30-06 Winchester round while the .30 caliber M1 carbine fired a much smaller round with the same diameter bullet. In one history book on the Pacific Theater events of WWII the author claimed the Japanese has at least three different 7.7 MM rounds for rifles and it was quite common for the logistics system to supply the wrong 7.7 MM round to combat troops. Which of these two rounds is fed into the FLaK 36 gun, I do not know. It is nice to strike fear into the hearts of your enemy. It is nice to illuminate your target for the gunners. This U.S. manufactured M1942A anti-aircraft searchlight could illuminate aircraft at 30,000 feet with its 800 million candlepower lamp. Really nice detail on the hangar wall. For the British, they were standing alone, on an island, faced with an Axis power that dominated much of the European continent. Early RADAR (RAdio Detecting And Range) technology was used to defend the home islands. This is one of the many excellent examples of signage and displays throughout the museum which work to educate the visitor as well as show the materials. There are numerous support displays within the museum. Here are a few of them. The frame of an M2 .50 caliber machine gun. Hanging above it is a U.S. Navy Officer Sword, just like the one in my closet. There are numerous handguns from WWII on display. The upper left appears to be a Mauser C96. Below it is a Luger Pistole Parabellum (Pistol for War) 1908. The upper right is labeled U.S. Model 1917 Revolver, .45 ACP. Some of the Model 1917s came from Colt, others from Smith and Wesson. They used a half-moon clip to retain the shoulderless, rimless .45 ACP cartridge. Below it is a Colt Model 1911 .45 ACP. The bottom row, left to right, is a German Model 1928 flare gun, a 9 MM Walther P-38, and a Beretta M1934 which utilized the .380, commonly called the 9 MM Short. There are at least two large rifle displays. The top appears to be a Thompson M1A1 submachine gun which fired the .45 ACP. Below it is the M1 Carbine which fired the .30 Carbine round, The iconic .30 Caliber M-1 Service Rifle, commonly called The Garand after its inventor. Below the Garand is a 1903 Springfield. Lower in the stack are an Enfield .303 of British notoriety. This display contains a number of German and Japanese WWII era rifles. The M35A2 and its series of trucks are commonly called a number of things, deuce and a half, related to early model payloads is common. They have continued to serve the U.S. Military since the mid 1930s with each version being better suited for their mission than the one before. The museum asset appears to be a running model and is in very good shape. It is identified as a 1967 Jeep Deuce Troop Carrier, M35A2, ID #012532428.